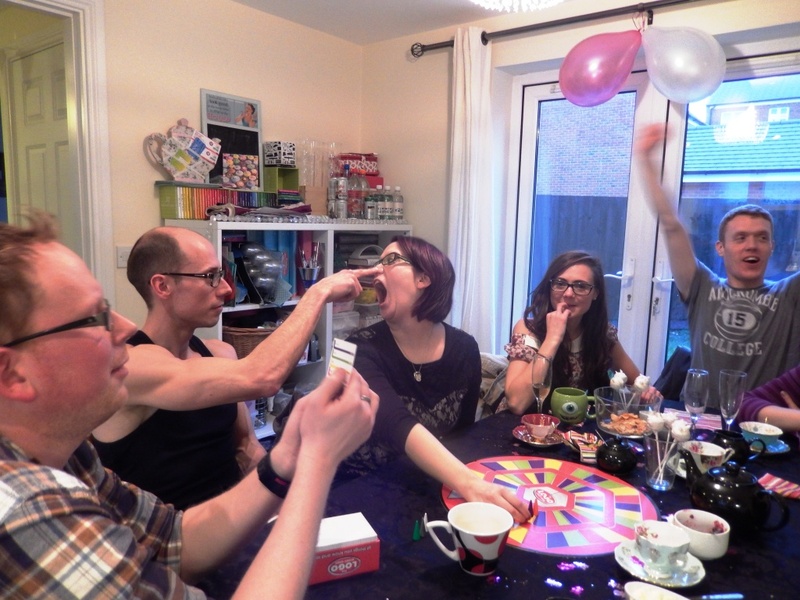 Ah yes, the week of my birthday, where, once again, friends and family gather to eat their own body weight in cake. 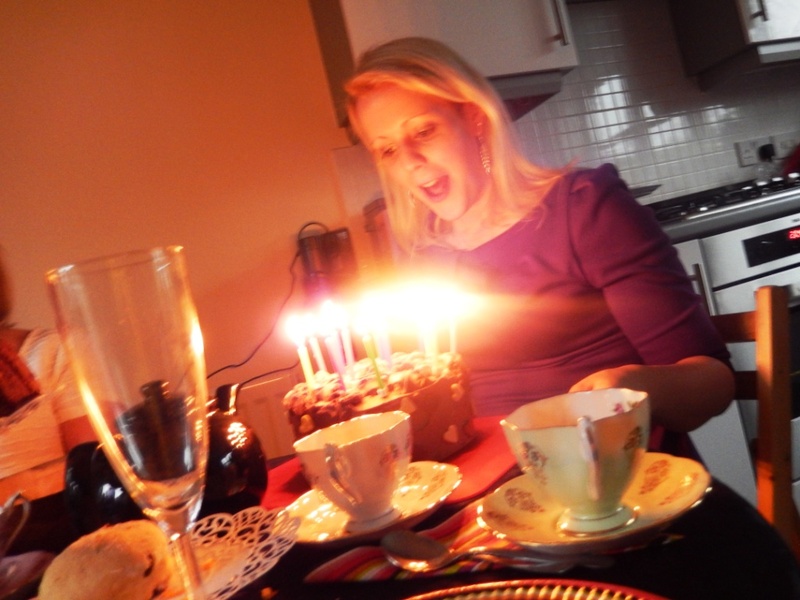 There is a definite theme to all my birthday presents and the respective celebrations at which they are received – cake, cake, and more CAKE! 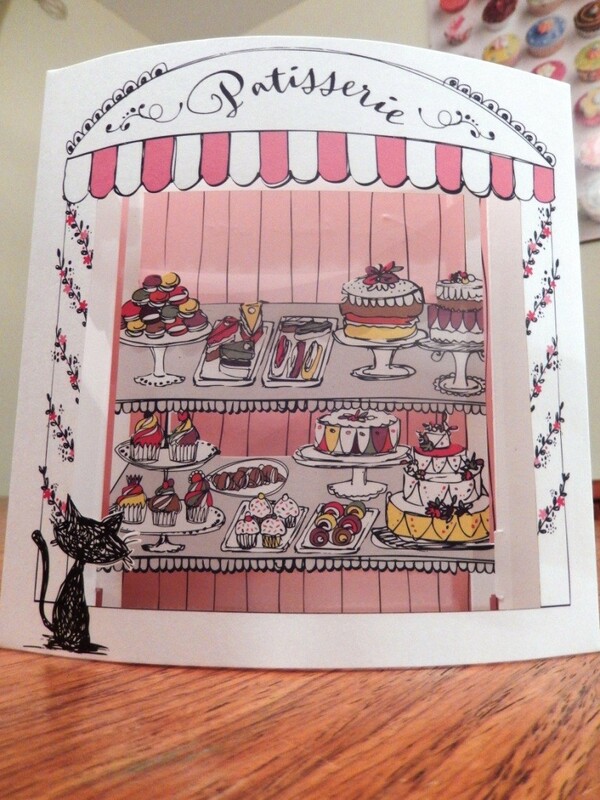 Take for example this amazing 3d patisserie card – will definitely be finding a permanent home for this little lovely in my kitchen. 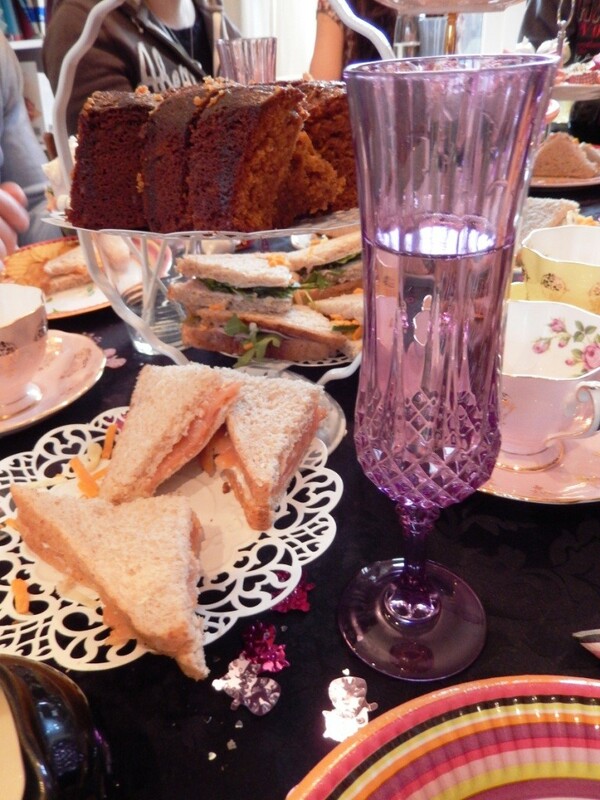 This year Rob and I hosted a birthday afternoon tea at home; we moved house in September and still love our new bolthole, as today proved it’s perfect for parties! Starting with sandwiches, served with champagne, we tucked in to the veritable feast in front of us. 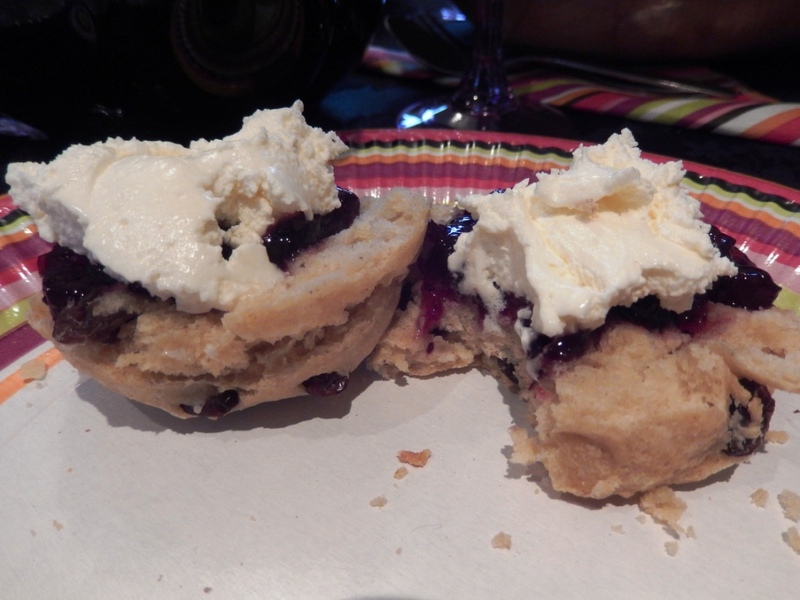 … and topped with home-made (by t’other Jen) blackcurrant jam, and whipped cream. Yum! 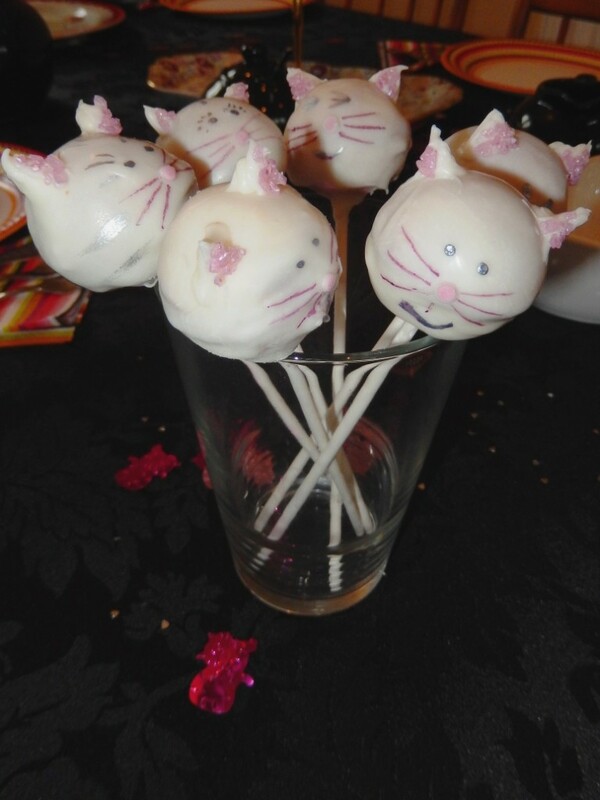 And and experiment with one of my brilliant birthday presents, a cake pop maker, little white kitty cat cake pops! They are not my finest work of art but not a bad testament to my battle with the evil that is candy melts. And what else could you finish a birthday party with, other than a big sticky birthday cake?! – that just got better and better when I cut inside. 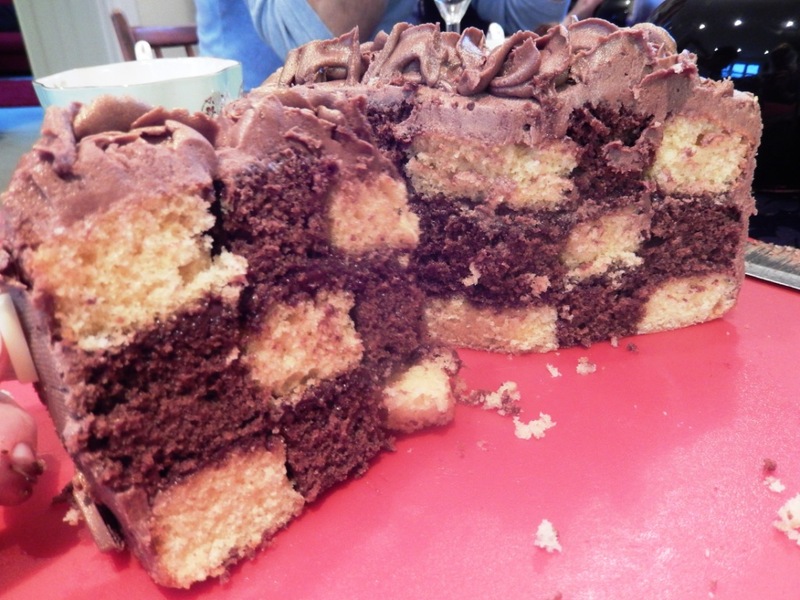 Look at the chocolate checkerboard! 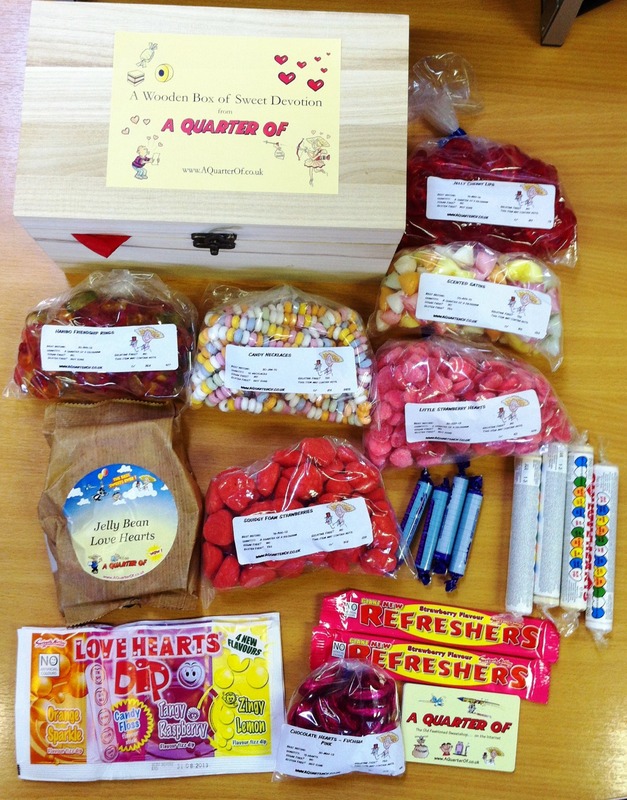 … before waving guests off with full tummies and little party bags! 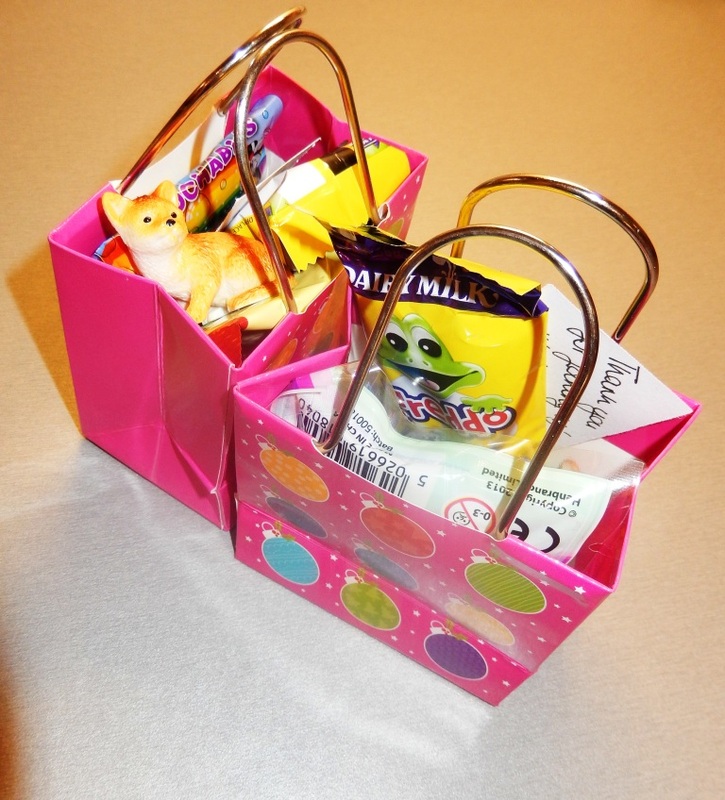 Who doesn’t love a party bag, at any age? At the moment I’m happy revelling in fresh produce from the garden. Not mine, I hasten to admit; we’re still living in a rented house, and I a vowed a couple of moves back not to spend ages weeding gardens and planting nice things just to move out before they’re ready. Rant over. I was really torn with what to do with these blackcurrants, so many choices! Jams, tarts, pies, macarons, the list is literally endless. 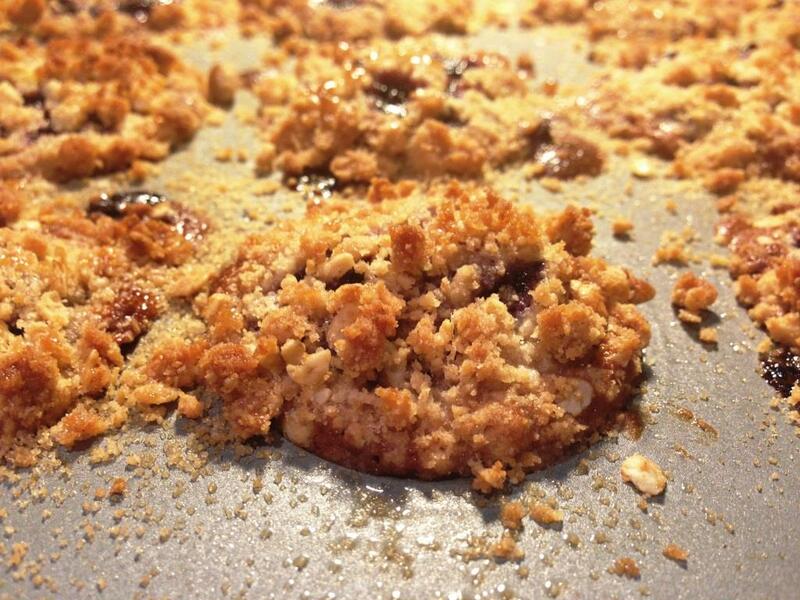 In the end I settled on a combination of cake and a great British classic – crumble. On looking for some crumbly inspiration, I was delighted to see one of my favourite blog reads, the Vagabond Baker, pop up in my google search results. 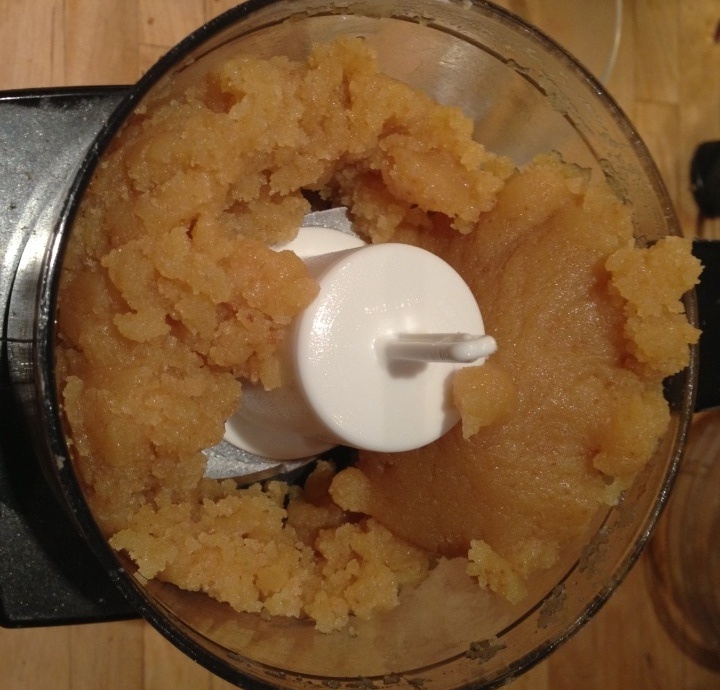 So, this recipe is an adaptation from Rachel’s delightful apple recipe, with a few interjections from other recipes such as this one on BBC Good Food. I loved the oozy custard on Rachel’s recipe, but also wanted a super-crispy crumble topping, so ended up adding a little extra sugar for a fantastic caramelised crunch. 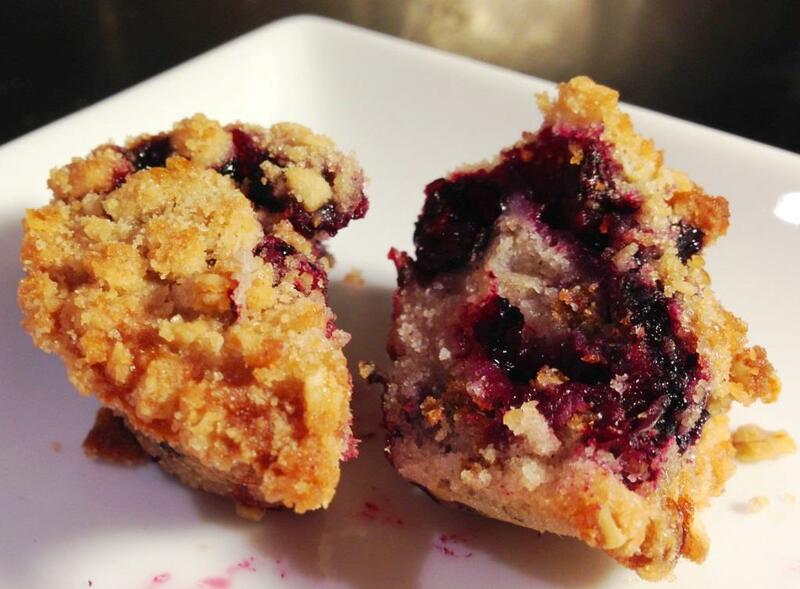 – To make the muffin mixture, melt the butter, and beat in the rest of the ingredients, leaving the blackcurrants to last. 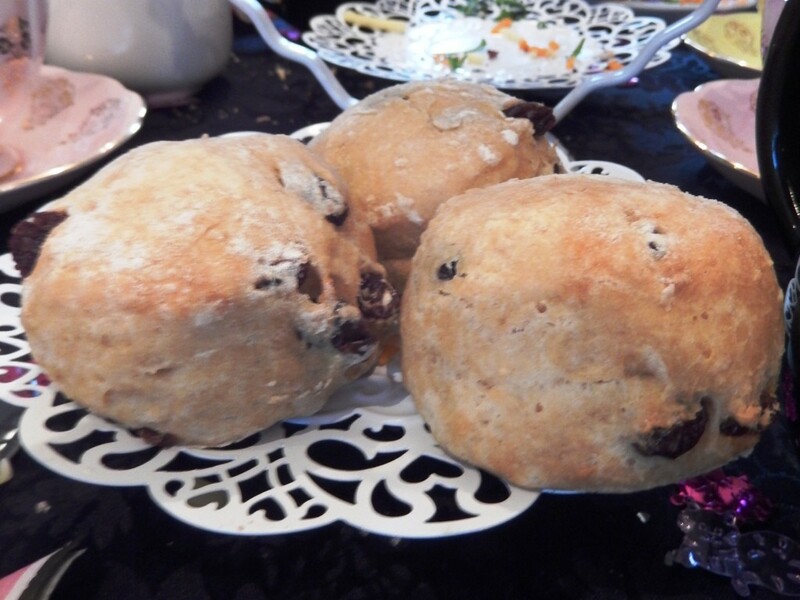 Don’t overbeat – it’s better to have a few bits of flour still showing that to have a big blackcurrant mess! 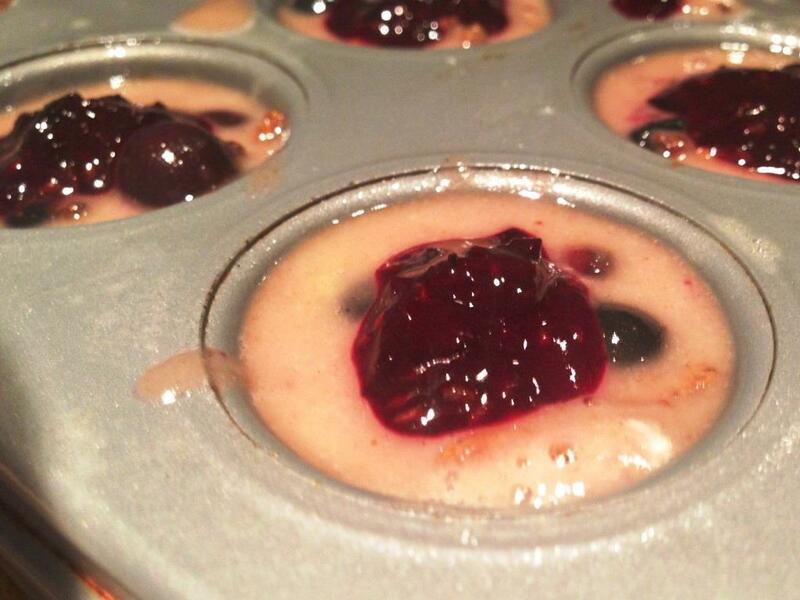 – Using a mini muffin tin, either use paper liners, or grease generously (e.g. 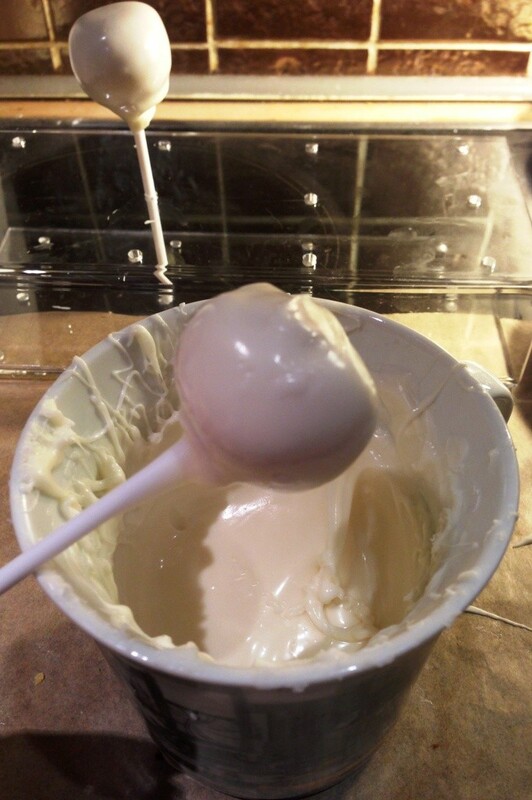 with cake release spray), and spoon in the mixture until the holes are around 2/3 full. 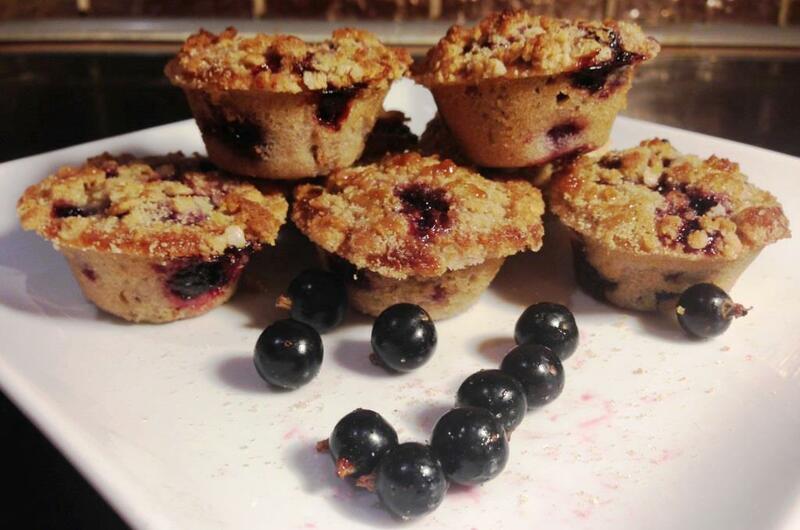 Try and ensure a good distribution of blackcurrants – there should be a good few in each muffin. – Make the jam sauce by microwaving (or heating on the hob), the remaining blackcurrants with their sugar and around 2 teaspoons of water. It should only take a few minutes for the fruit to break down and turn into a bubbly jam. 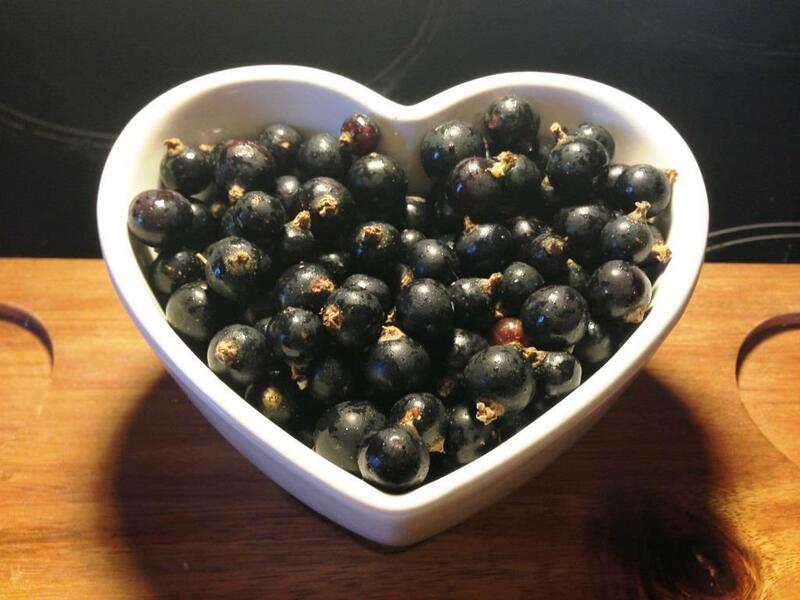 Any blackcurrants which don’t conform, stir and squish with the back of a spoon, so you have a runny jam. 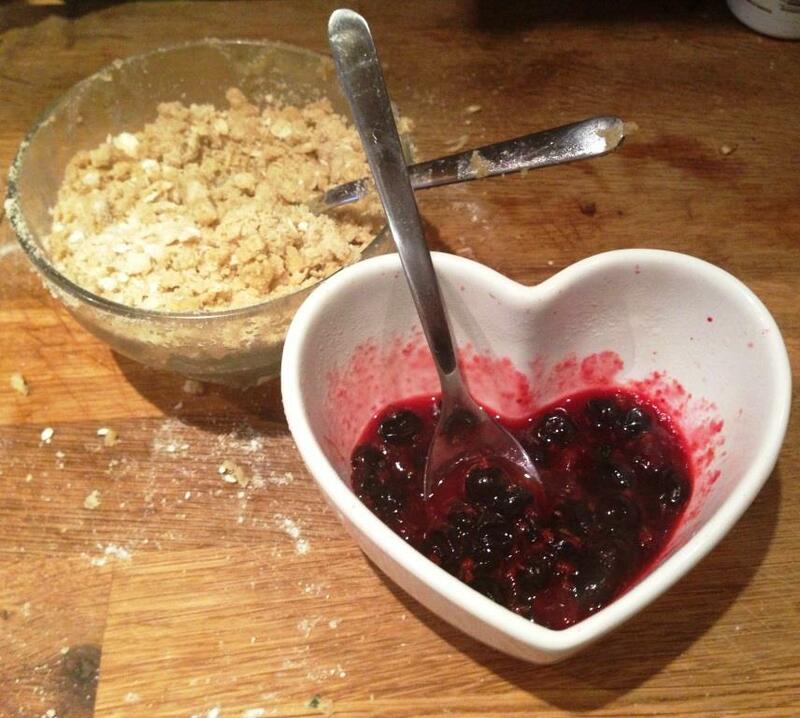 – For the crumble, place all the ingredients in a large bowl, cubing or cutting the butter into small chunks. 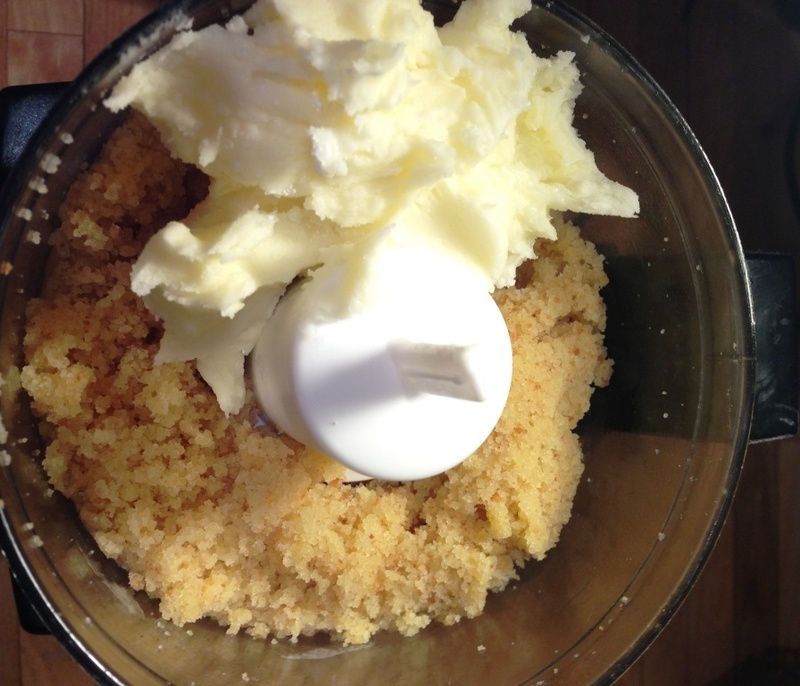 Using your fingers, rub the butter into the dry ingredients until it forms a dense crumb. 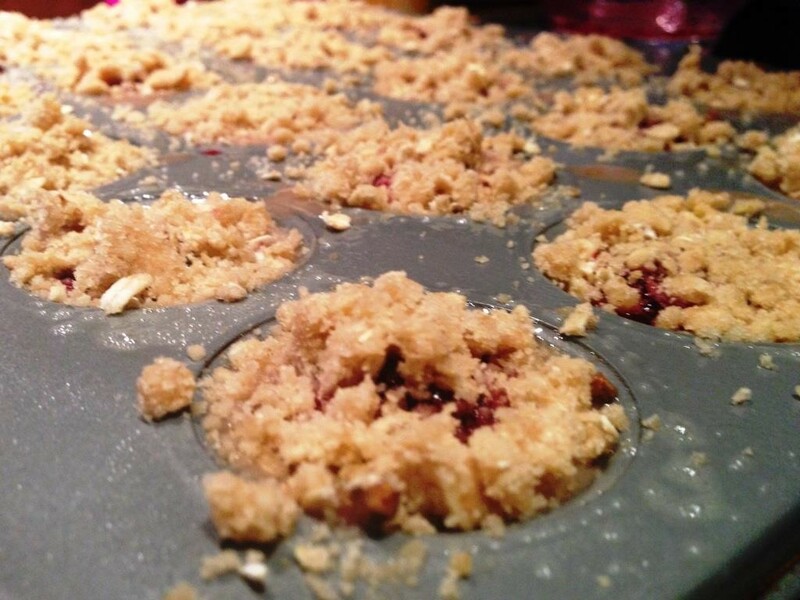 – And top with a good sprinkling of the crumble mixture, making sure all sides, and the jam, are completely covered. 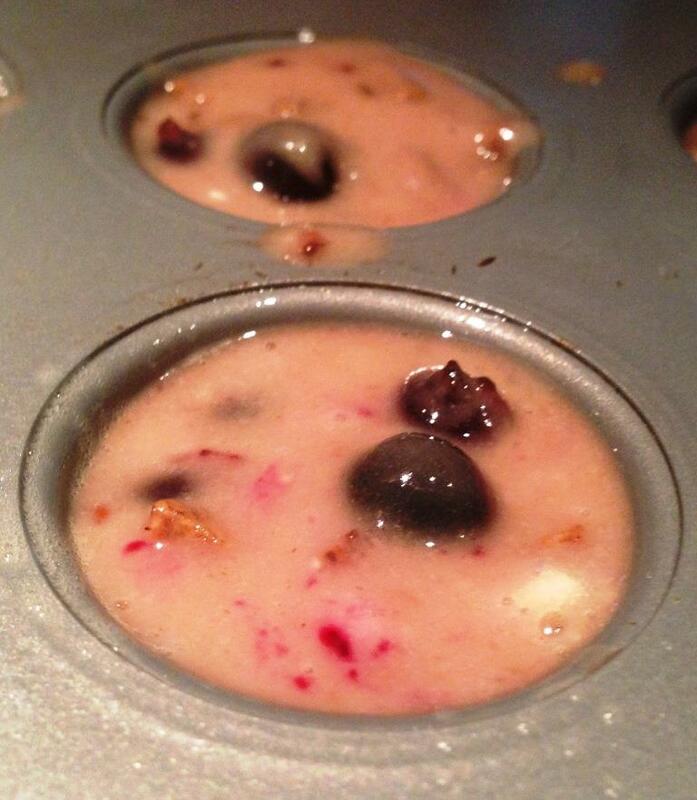 – Put the muffins into the oven, at 180 degrees, for around 12-15 minutes. 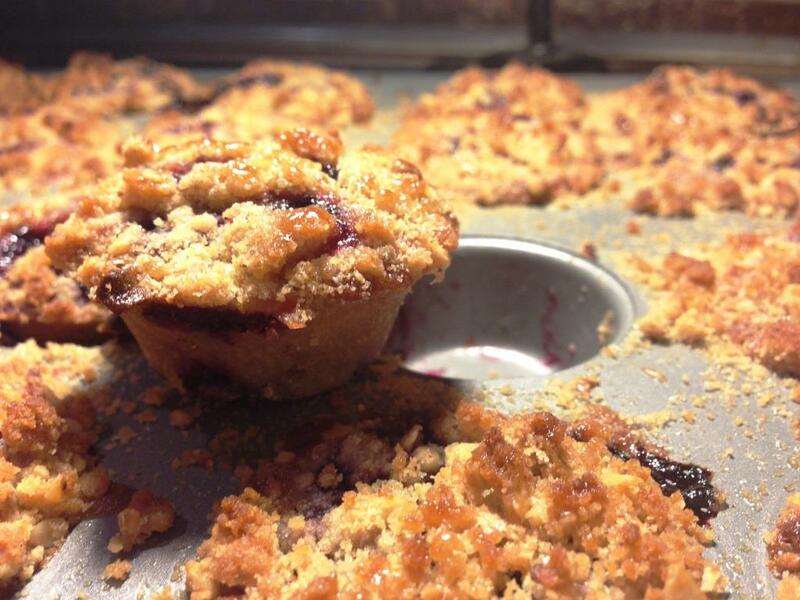 This will entirely depend on your oven, but you want to take them out when the crumble is just starting to colour. 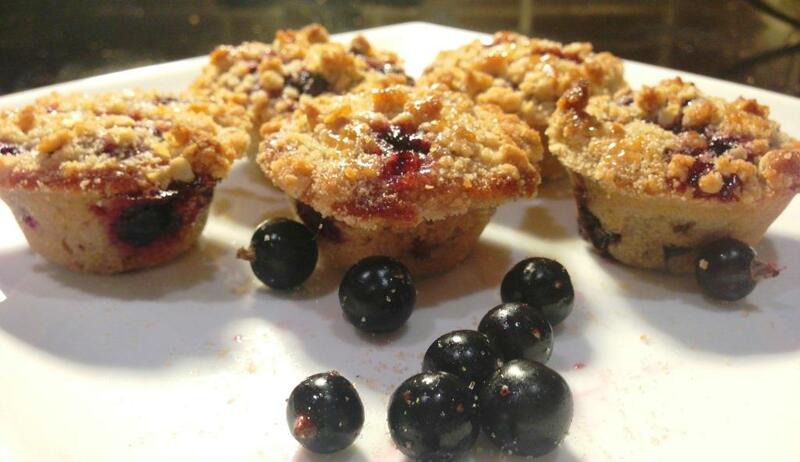 – Using the extra tablespoon of sugar, carefully sprinkle a pinch over the middle of each of the muffins. 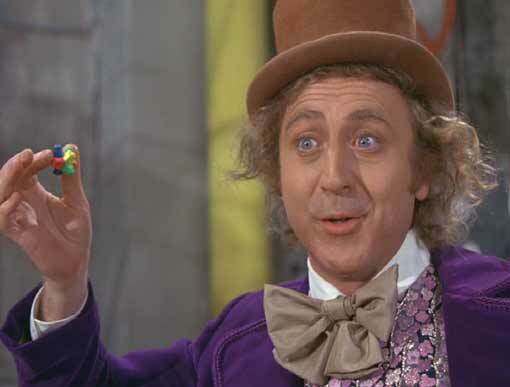 Again, using your fingers, drip a few drops of water on top of the sugar, so it starts to dissolve. Return the muffins to the oven, and flick on the grill. Keep a close eye as when they start to caramelize it will happen very quickly, and there’s a fine line between crunchy caramel and burnt! It should take a couple of minutes, and the tops will start bubbling and become lovely and golden. Once they do, remove from the oven and allow to cool completely. Once cool, carefully extract from the tin, using the point of a sharp knife to lift them out. They are best enjoyed straight away, whilst they will keep in an airtight container, the caramelized crumble will gradually lose its crispiness. If this does happen, you can easily pop them back under the grill for a couple of minutes to crisp back up. Needless to say they didn’t last very long in our house! I am completely in love with these little bites, but can’t decide what I like more, the sticky, fruity inside, or the caramel, crunchy topping…? 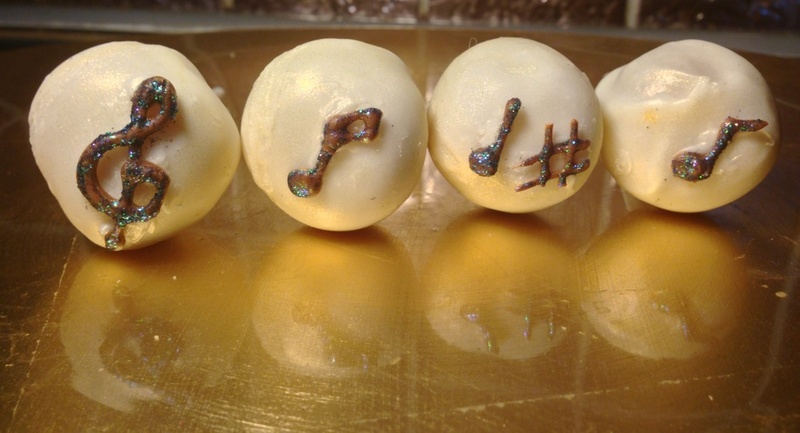 The Sound of Music Lemon Cake Pops – with Handy Hints! 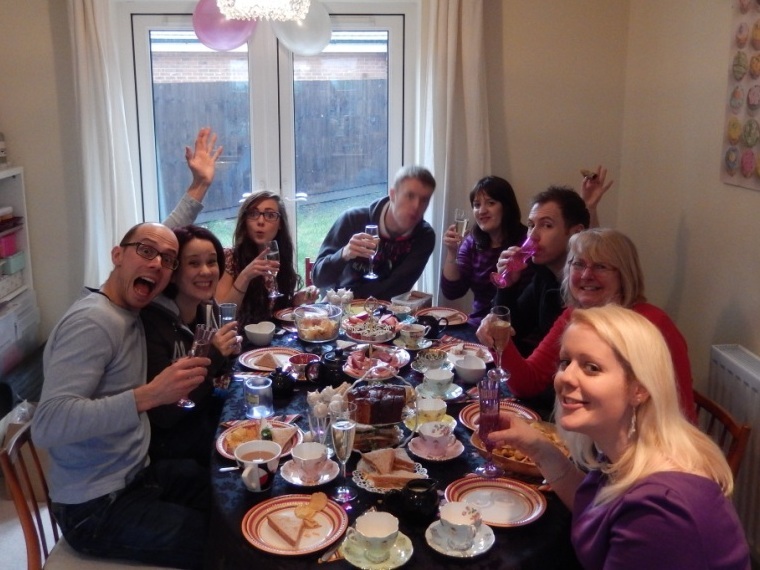 This weekend just gone was largely centred around (another!) rather amazing theme party. This time – Musicals and Theatre. I have another bake to share with you but as time is tight I had to get the shorter one up first! I’d been itching to try out the new cake pop stand that Secret Santa bought me for Christmas, and this was my first real opportunity. 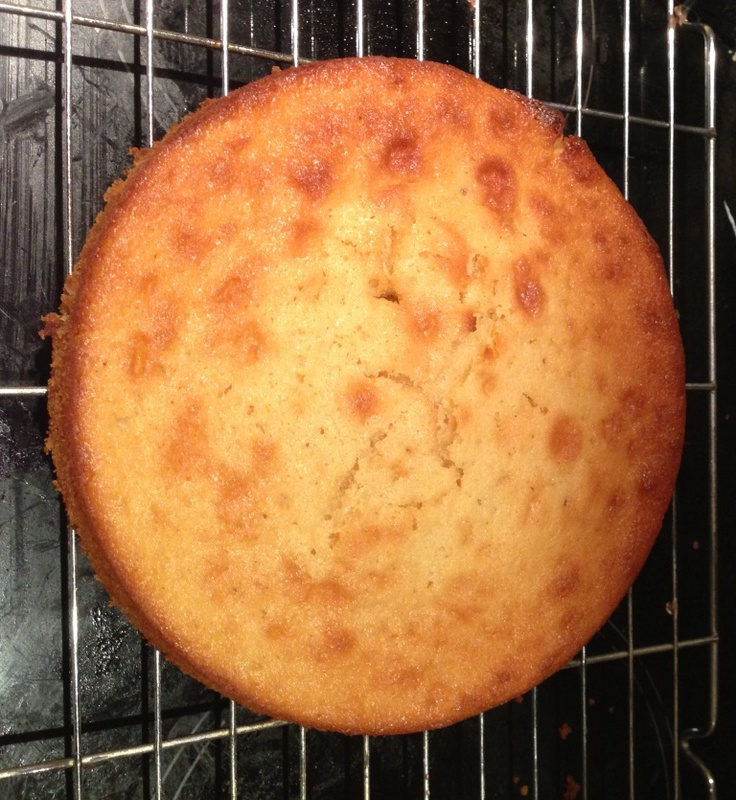 First up – a quick lemon sponge cake, using 100g butter, 100g sugar, 2 eggs, 110g SR flour, and 1 tablespoon of lemon juice. It seemed a shame to break it up and put it into the blender but, as soon as the cake was cool, its fate was set! I picked up a surprisingly amount of tips during my quick cake pop session at the April Delights course back in December. 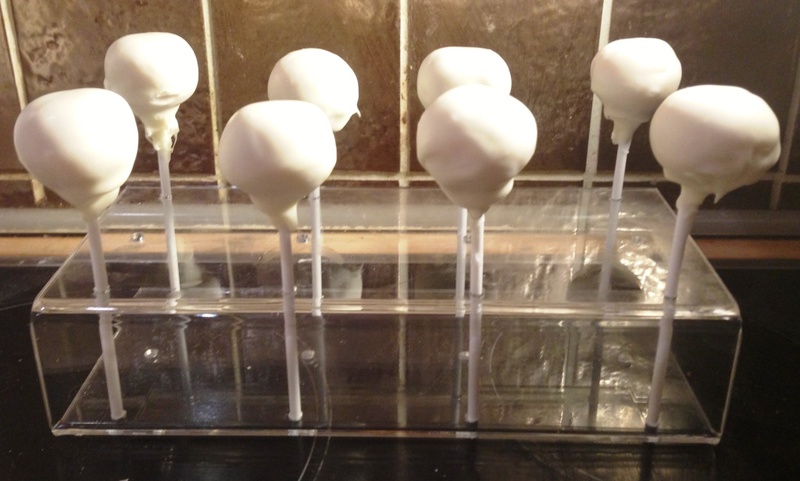 It seems to me cake pops are a combination of luck, practice, patience and general confidence, but these tips certainly helped me get better results that previous attempts. 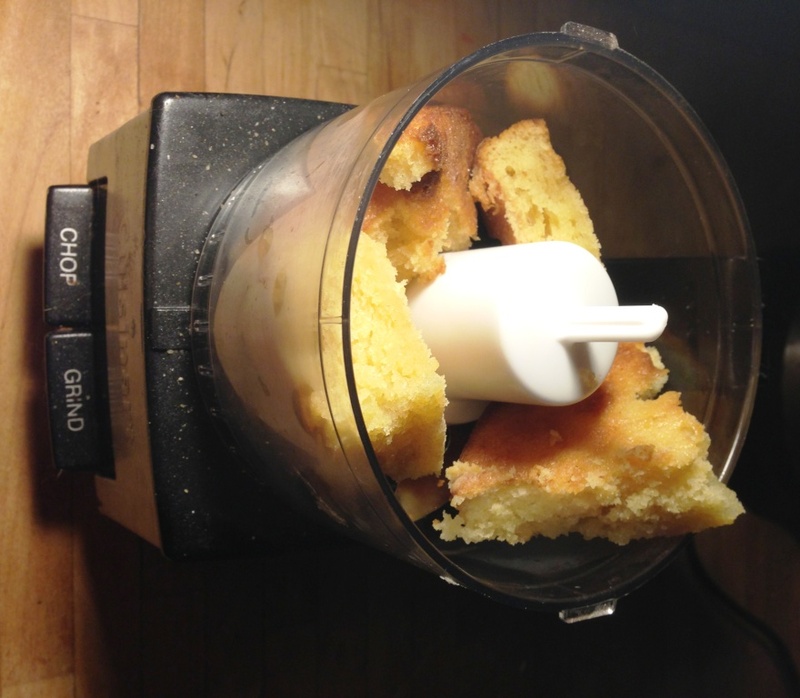 Tip 1 – ensure your cake is a very fine breadcrumb. A blender definitely helps with this, you can do it by hand but just be very thorough. Tip 2 – go easy on the buttercream. You can see below it only really took a spoonful, again the blender is useful here. You want the mixture to just be at the balling up stage (second picture below) – i.e. the buttercream only just sticks the cake, it’s not too sticky or mushy. Clearly I made far too much buttercream, you can see the remnants on the Chocolate & Lemon Hearts post from last week. 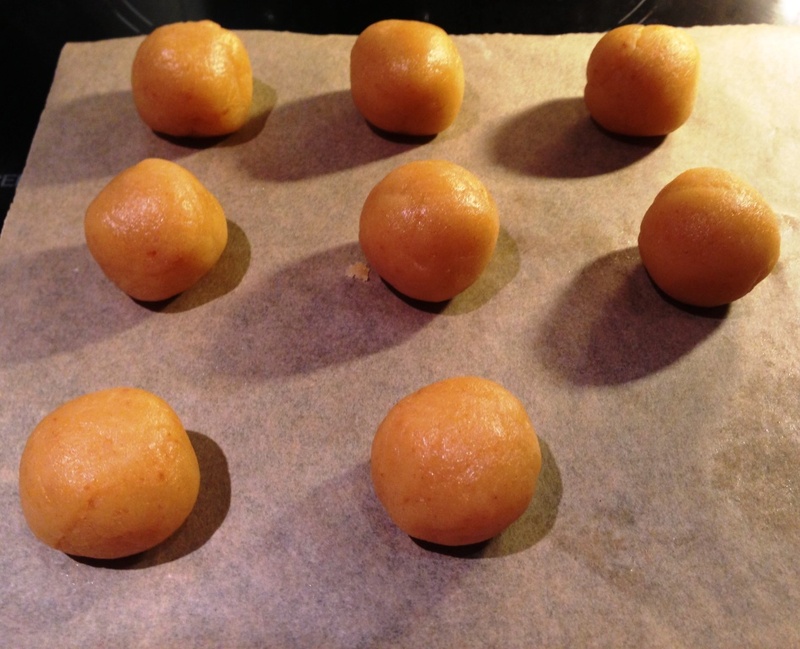 Next up – dividing the mixture into equally sized balls, laid out ready for their sticks and coating. 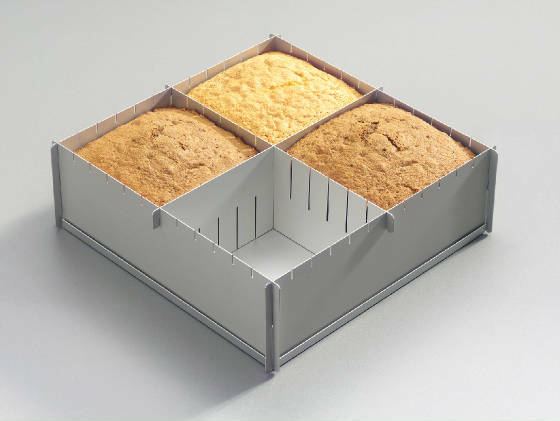 Tip 3 – try to avoid refrigerating your cake mix. 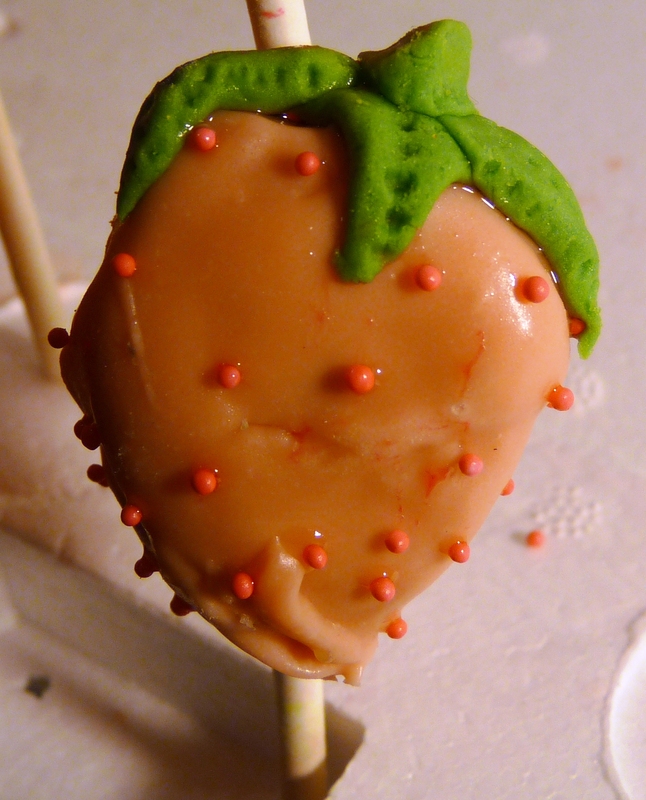 It will be too cold once it gets smothered in the candy melts/chocolate, and the combination of heat differences and contracting on cooling can cause your precious cake pops to crack. If your mixture has a good buttercream to cake ratio, it shouldn’t be sticky so shouldn’t really need to go in the fridge anyway. Next up, prepare your chocolate or candy melt coating. Although I’m still a little unsure about them (what exactly ARE they?! 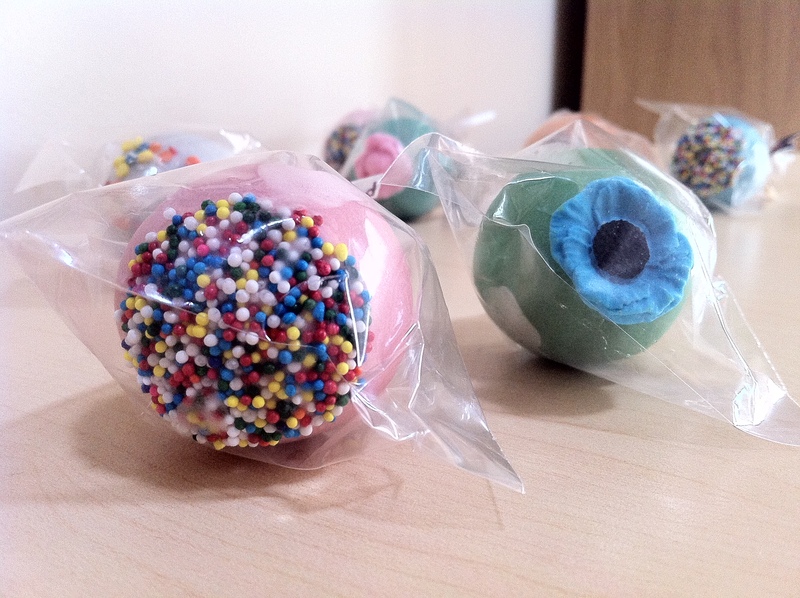 ), I can’t deny that candy melts work wonders when it comes to cake pops. 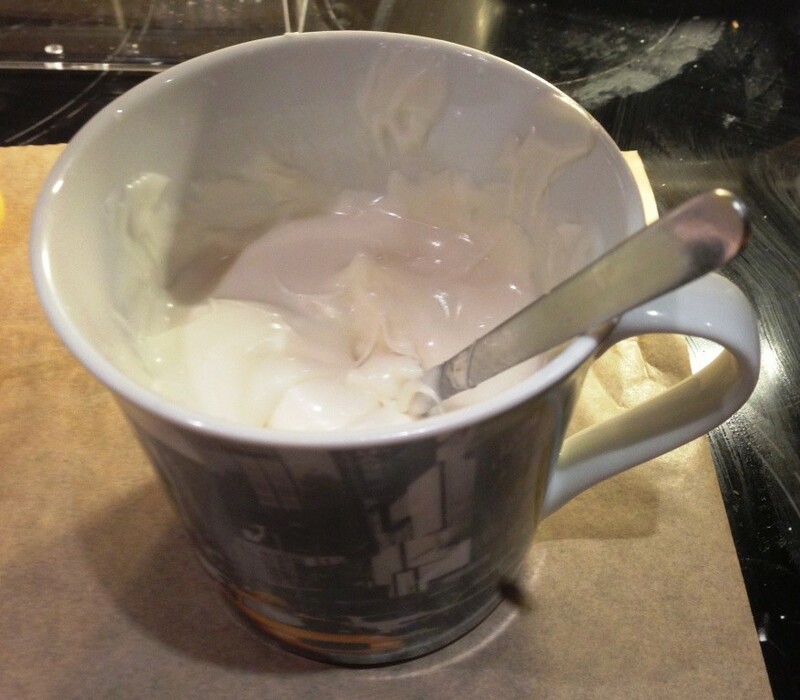 Tip 4 – prepare your chocolate/candy coating in a thin, tall mug. 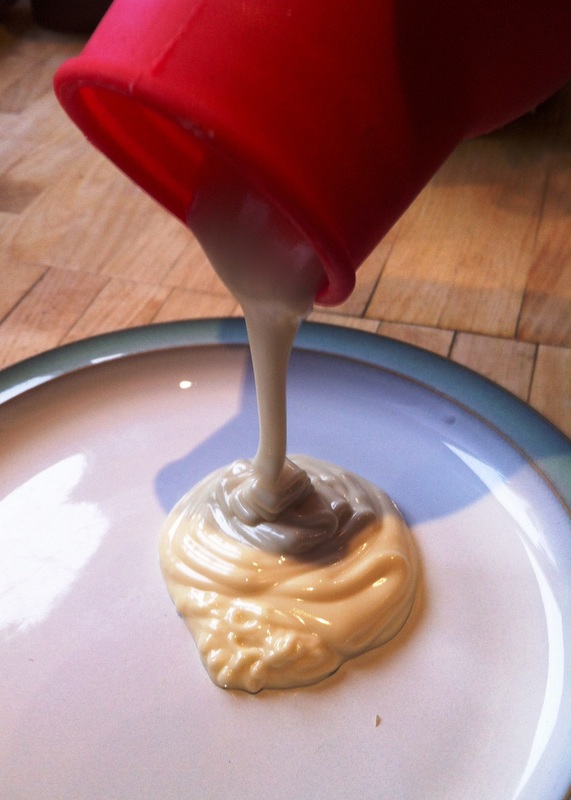 This will give you a good depth for dipping without having to prepare a lot of excess coating. (I found this one online but cannot remember the site at all, apologies). 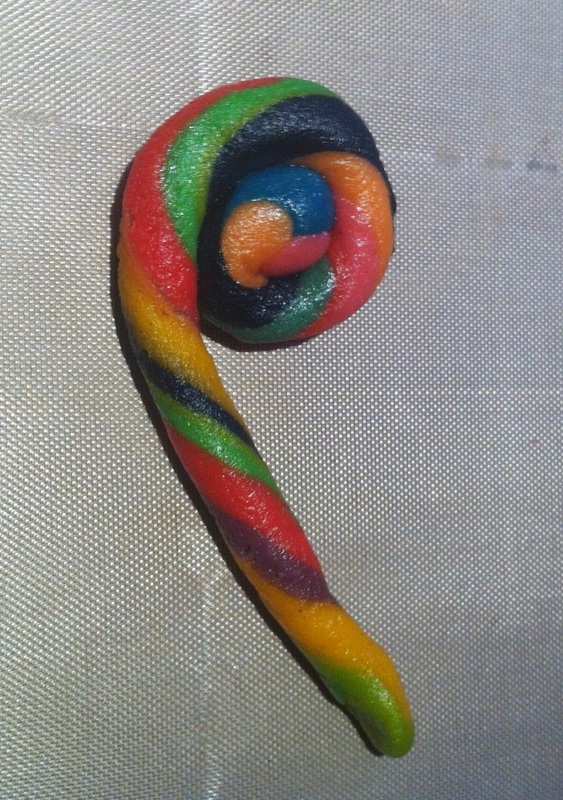 I find that candy melts need a good teaspoon or two of vegetable fat (I use trex) to get them to a good dipping consistency. 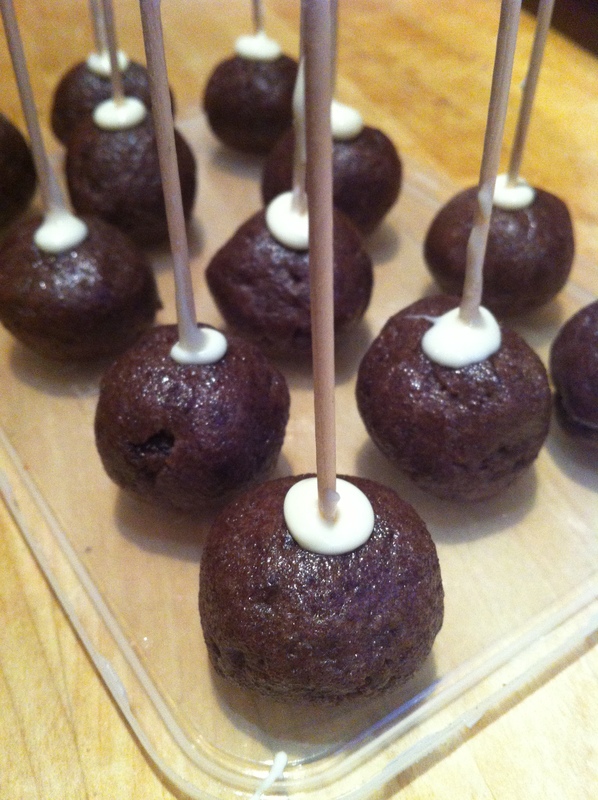 It makes the cooling/setting process a little slower but definitely helps them coat the cake pops better. 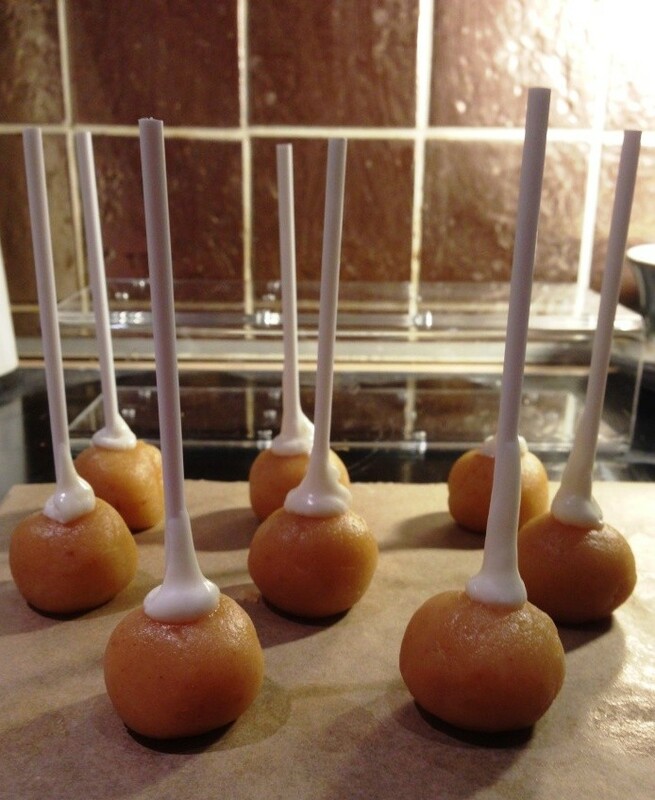 Have your sticks and cake balls all ready to go so you can attach them together quickly and easily. I love taking photos at this stage – they still look so uniform and perfectly cute! Now, onto my least favourite part, dipping. Make sure the bases on the sticks are set firmly (you shouldn’t get chocolatey fingers if you touch them), and if not, wait! They will only fall off… If you’ve added oil or vegetable fat to candy melts, or are using chocolate, you may find this takes a good few minutes. I don’t really want to give tips on dipping as I’ve not quite perfected it yet. The cake obviously needs to be completely coated, followed by a combination of rolling and tapping lightly on the side of the mug to help the excess drip off. 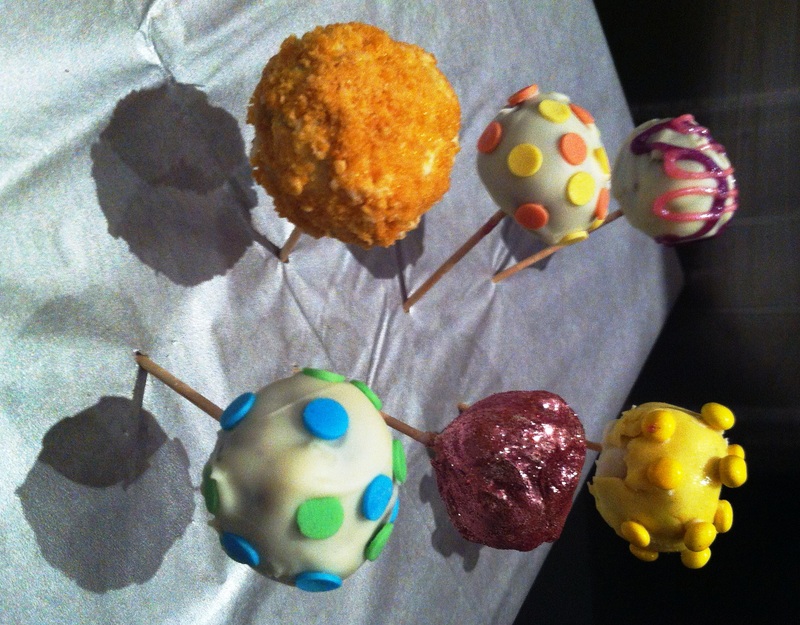 The one big Tip 6 is that it makes life SO much easier having a cake pop stand! 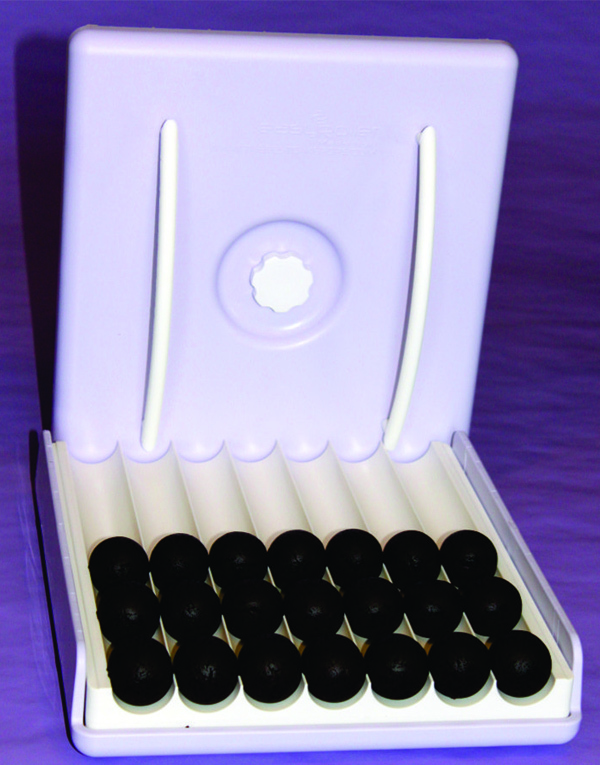 Not having to fiddle around trying to balance your chocolatey sticks in polystyrene, mugs, or whatever else you may have to hand, means that you can keep the pop perfectly upright straight away, and has plenty of room to set whilst you make the others. 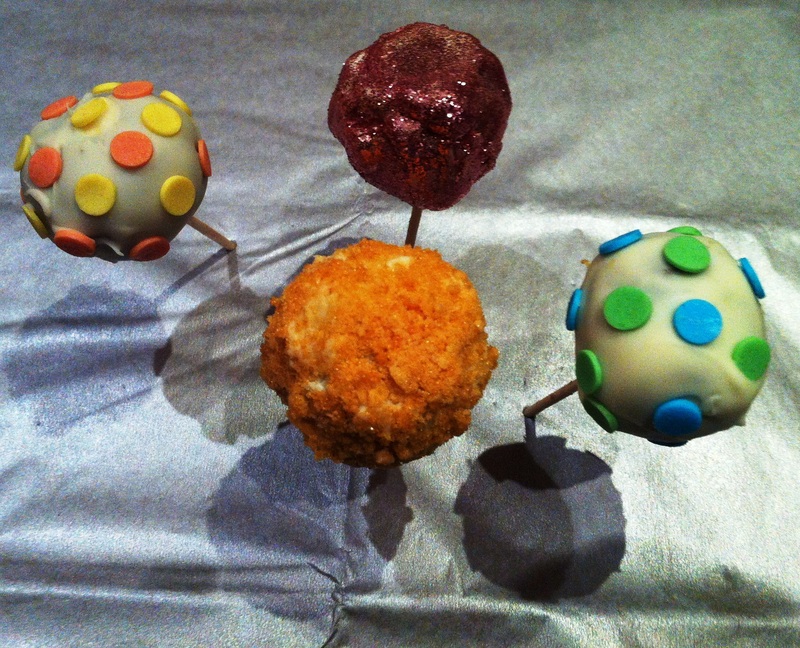 With my basic cake pops finished I went onto decorations. To fit in with the party’s musical theme I was originally just going to do a combination of different notes, treble clefs, etc. 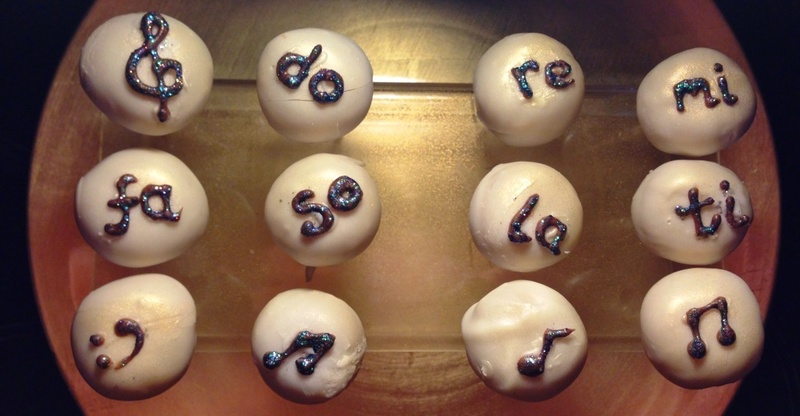 But once the idea of the infamous “do, re, mi” song got into my head, I was decided! 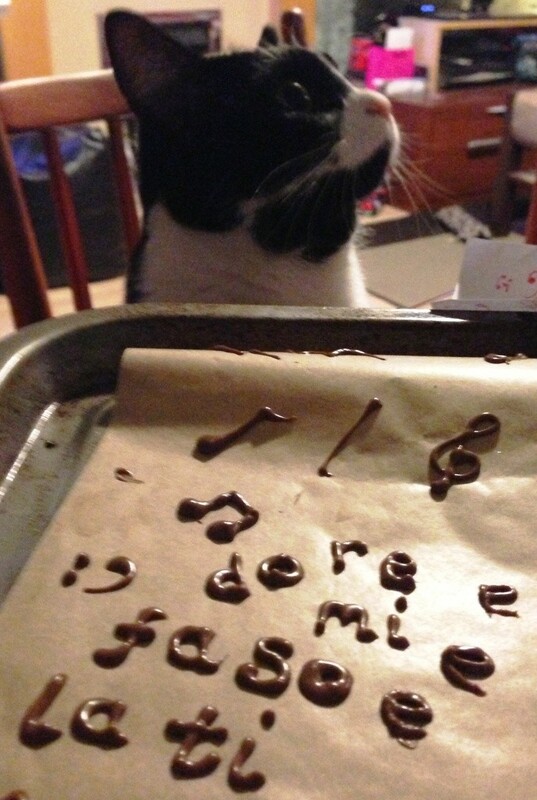 Under close supervision from Chilli (cats do like chocolate, don’t you know), I piped some letters and notes onto greaseproof paper. These were made out of normal milk chocolate, I’d have liked some black candy melts but wasn’t going to buy a whole pack just for these little details! 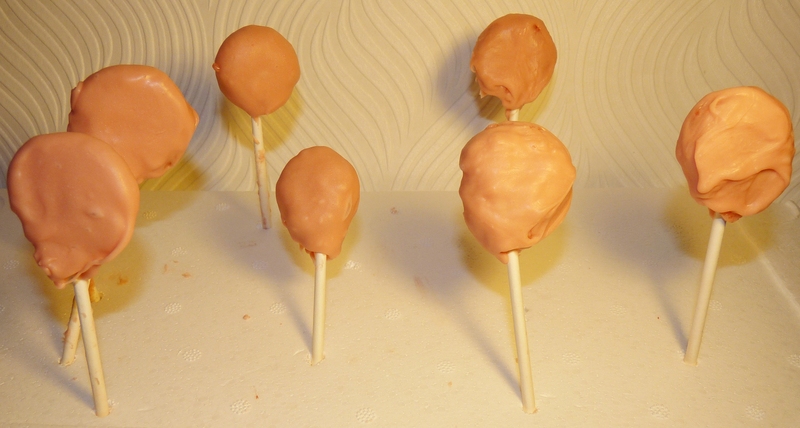 After letting the chocolate set in the fridge, I carefully ‘glued’ the decorations to the top of the cake pops using a little more white candy melt, applied with a cocktail stick. And to finish – a good spritz of gold shimmer spray, and black edible glitter carefully applied to the chocolate detail. 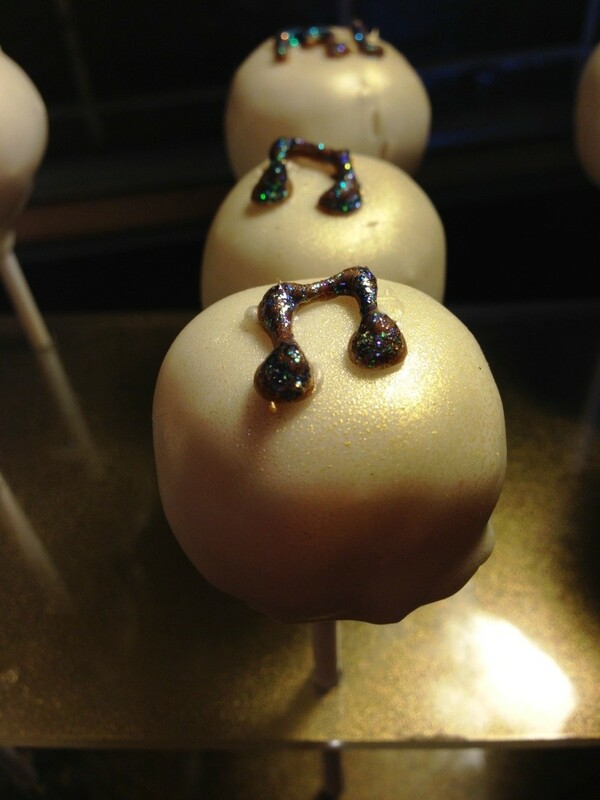 Hey presto- fabulous musical cake pops! 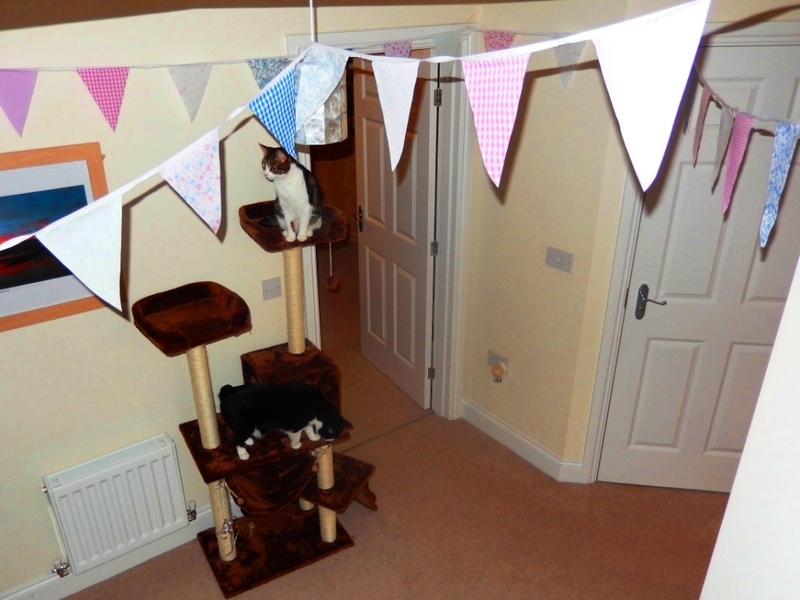 Not perfect but I’m quite pleased how they turned out, and they certainly went down a storm at the party! 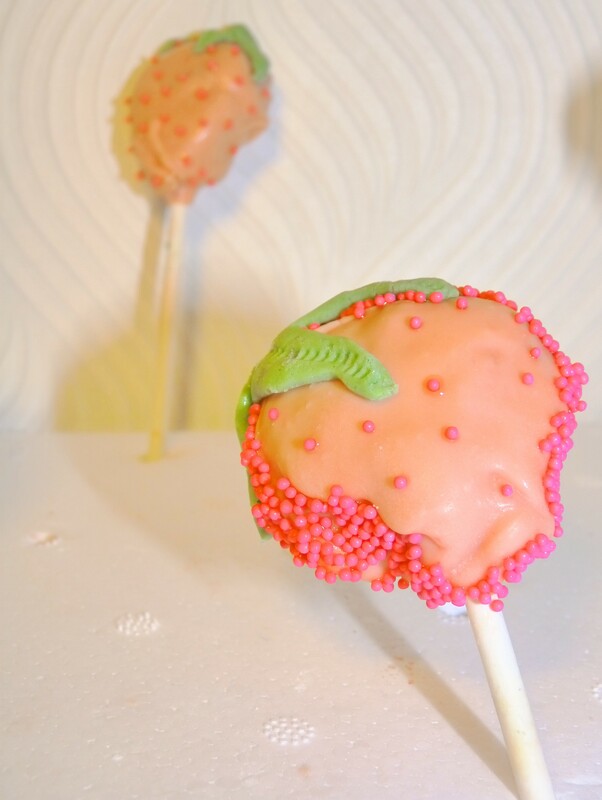 Last Sunday I spent a truly delightful afternoon over at April Delights in Bestwood (a few miles north of Nottingham city centre) taking part in a cupcake and cake pop decorating class. I’d paid for the class about 6 months ago through groupon – the price of £23 seemed like a bargain for 4 hours of cake tuition. However by the end of the afternoon I’d realised you can actually book classes directly for the same price – you live and learn! The class was fully booked, there were about 20 of us in total, and we all had a little workspace with a mat to roll the fondant, rolling pins, and access to all the cutters, tools, colours and glitter we could need. The owner of April Delights – Adele – spent about half an hour taking us through 3 of the more complicated cupcakes – Rudolph, Santa and the Christmas Tree. Broken down into easy steps they seemed so easy! Then we were set off on our own to try to remember how on earth she’d gone from a big ball of white fondant into these perfect looking cakes. First up was embossing a fondant topping for the cupcakes. 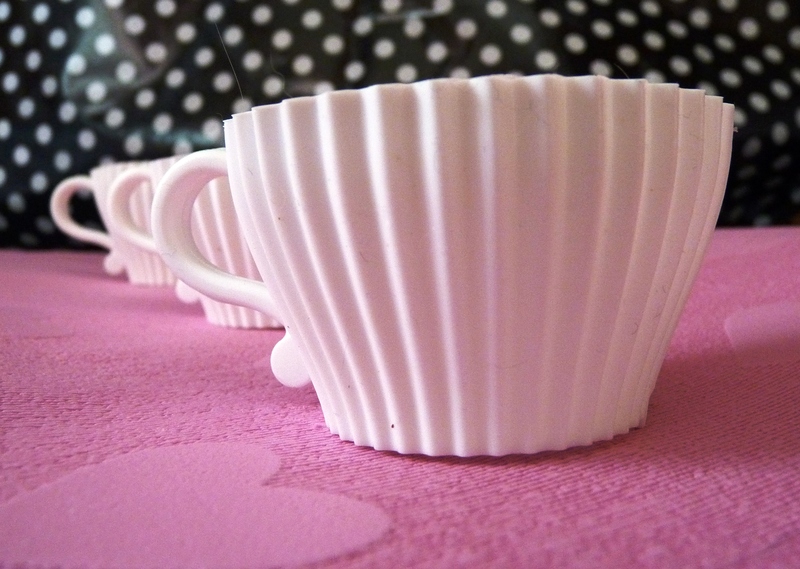 We used pre-made vanilla cupcakes, which had a sugar glaze to help the fondant stick. 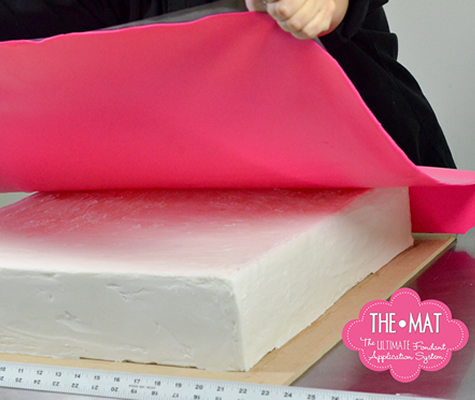 After pressing in an embossing sheet to create the pattern, it was simply a case of using a round biscuit / pastry cutter the same size as the cake to get the perfect size. I went for the reindeer first – on the brown base – which was largely a case of rolling and moulding brown fondant into the right shape for the head, before adding eyes, antlers and a nose also made of fondant. Sounds simple but took rather a lot of sculpting to get him right! Everything we made was stuck together with edible glue which is so easy to work with – it stays tacky for quite a while and dries clear, so was perfect for all the little details. Next up was the Christmas tree. This was simply a brown based, topped with 6 green stars, in decreasing sizes (2 each of large, medium and small), staggered to give the branch effect. 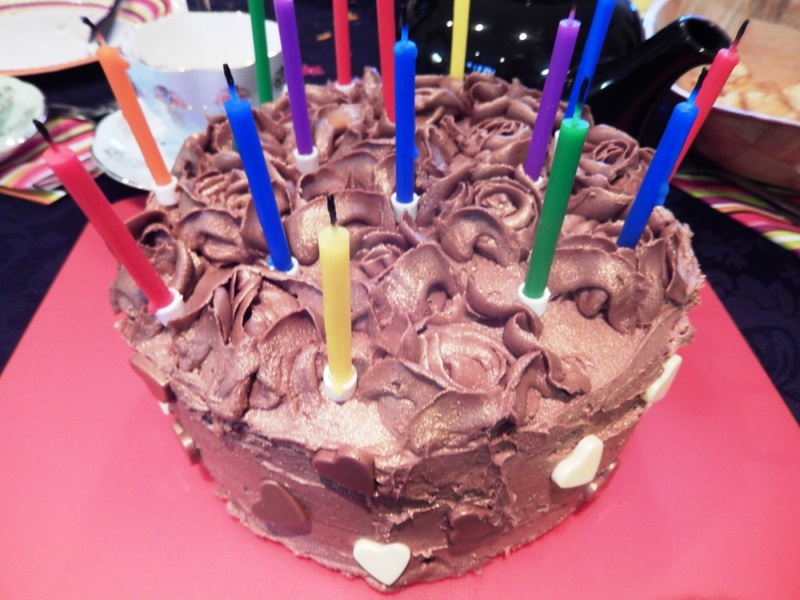 I love how simple this cake was – completely different to the Chocolate Brownie Christmas trees I’d made the week before, but equally as effective. By this time I was feeling a little more adventurous and loved having an experiment on my other cakes. The Santa that Adele had shown us was upturned in a big pile of snowballs – but I decided to do mine as “when Santa got stuck up the chimney” – as my mum is forever getting this song stuck in her head at this time of year! It took a bit of time to shape the chimney and mark in brick lines, but the legs themselves were quite simple. A great tip to create the look of fur (around the edge of the boots) is simply to mottle the white fondant with a cocktail stick or edge of a small tool. For the wreath I simply used a small leaf cutter, 3 different shades of green, and finished off with a few red berries. For my 5th cake I went for some classic Christmas presents – relatively simple cubes of coloured fondant, with slightly more fiddly ribbon wrapping and bows. I love the black fondant base, but it needed something more to set it off – cue some gold lustre and soft gold pearls. Finally – and I think my favourite – igloo and penguin. For the base I added some blue gel colour to white fondant, kneading through until it had just swirled into an icy effect. I tried a number of ways to make the igloo, and in the end settled on chopping white fondant into small blocks and building it up. It certainly wouldn’t last long in the arctic, my construction skills leave a lot to be desired! But the star of the show – my little penguin! Again he is entirely made out of fondant – a black body, orange beak and feet, white tummy and eyes. By the time I got to the eye pupils it was getting a little fiddly, so I used the end of cocktail stick to paint these on with a little gel colour. I sat him on a blue snowflake for extra icy look. As if hours of cupcake making wasn’t enough (it took me 2 1/2 hours to make 6 cupcakes – how does anyone make a living out of this!) 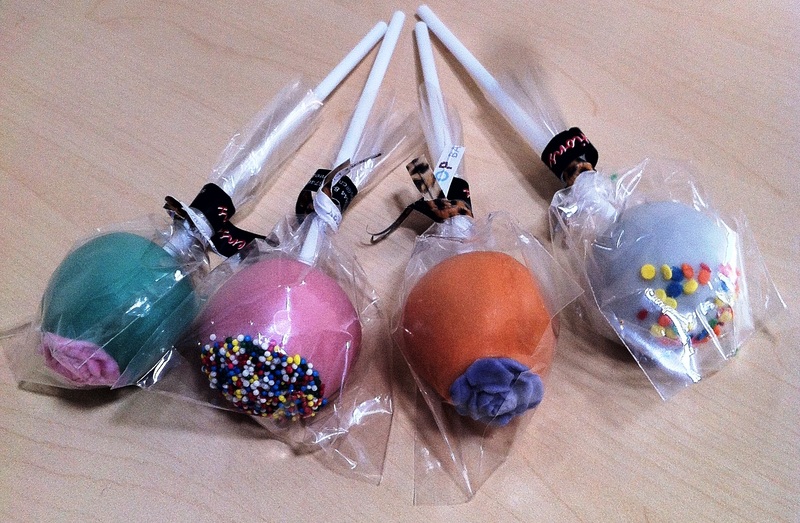 – we also whipped up a quick set of cake pops. 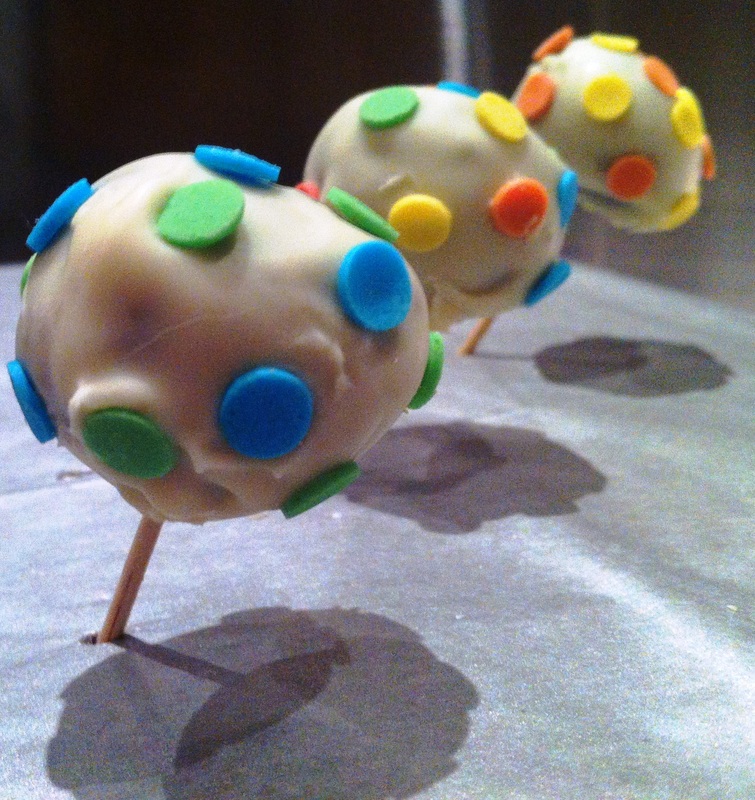 Using a pre-mixed butter cream/cake combo for the balls, they shaped remarkably well and dried quickly and well-rounded in the white candy melts. Why isn’t it this easy at home! 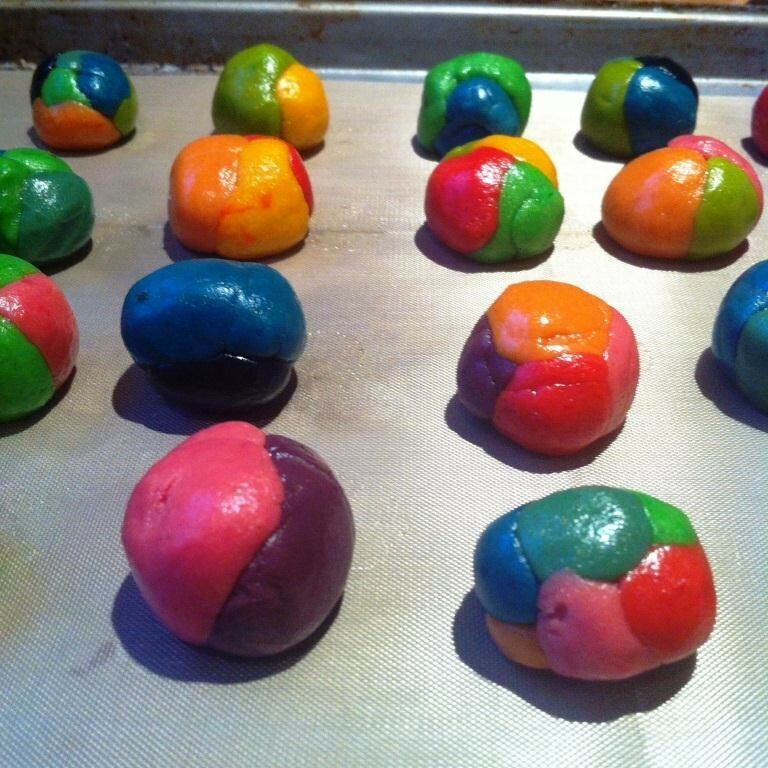 I think my lesson learned here is to have a very thick, almost dry dough to make the cake balls with. 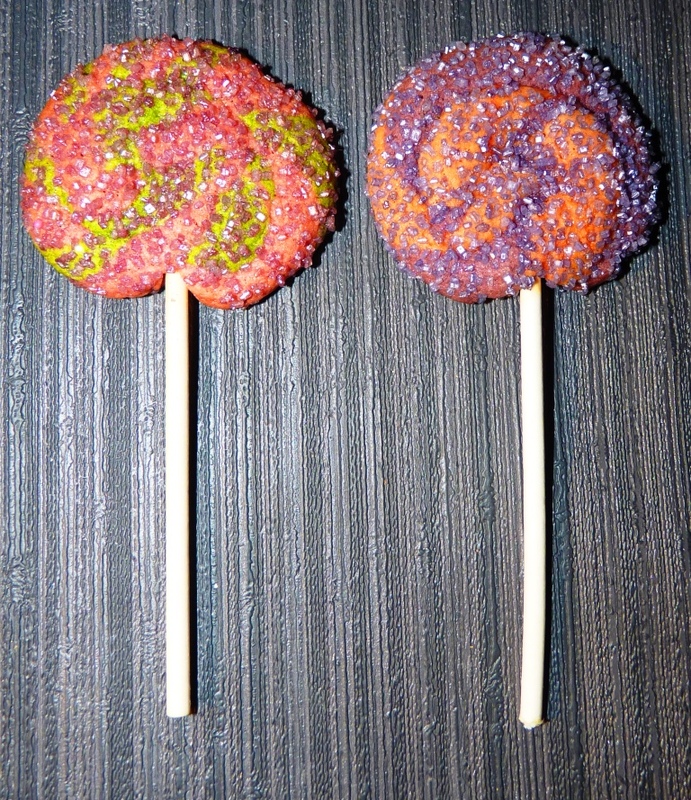 They rolled really easily without sticking to my hands, and held their shape and form on the stick perfectly. 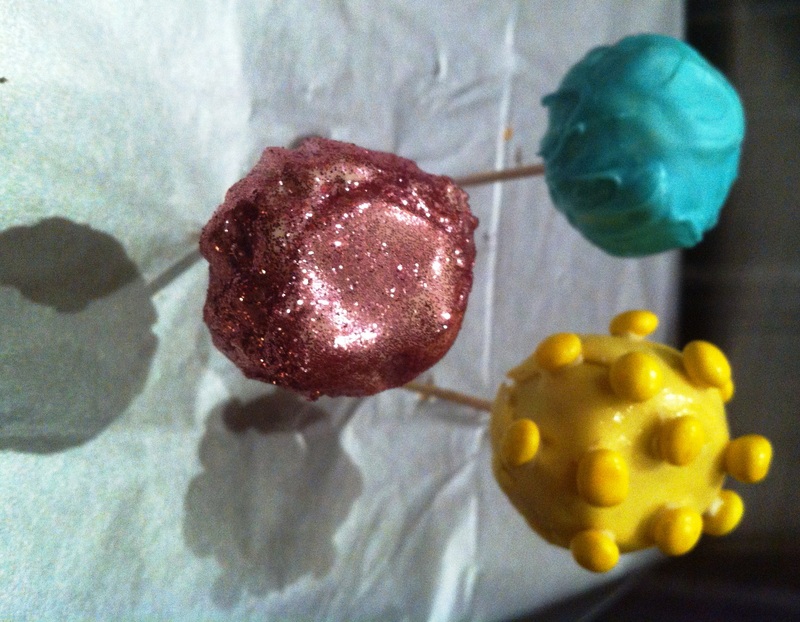 We only had time for quick decoration of the cake pops – some wintry snowflakes, red love hearts, and some gold sparkly sugar. Overall I really enjoyed the course. Perhaps just because it was great to spend 4 unadulterated hours making cakes, with all the equipment on tap, or having 6 pretty cake pops and 6 cupcakes to take home, or picking up some new tips and meeting like-minded people along the way. 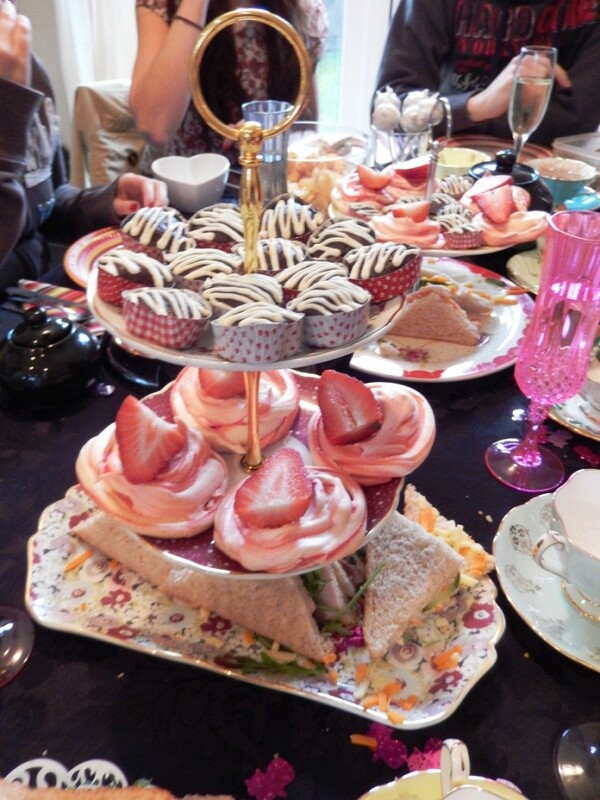 I’d definitely consider going back and will be keeping my eye out on upcoming courses – they do large feature cake courses as well as cupcakes and basic skills. Before I left I had a quick snoop around in the studio at some of Adele’s amazing creations – and wow! 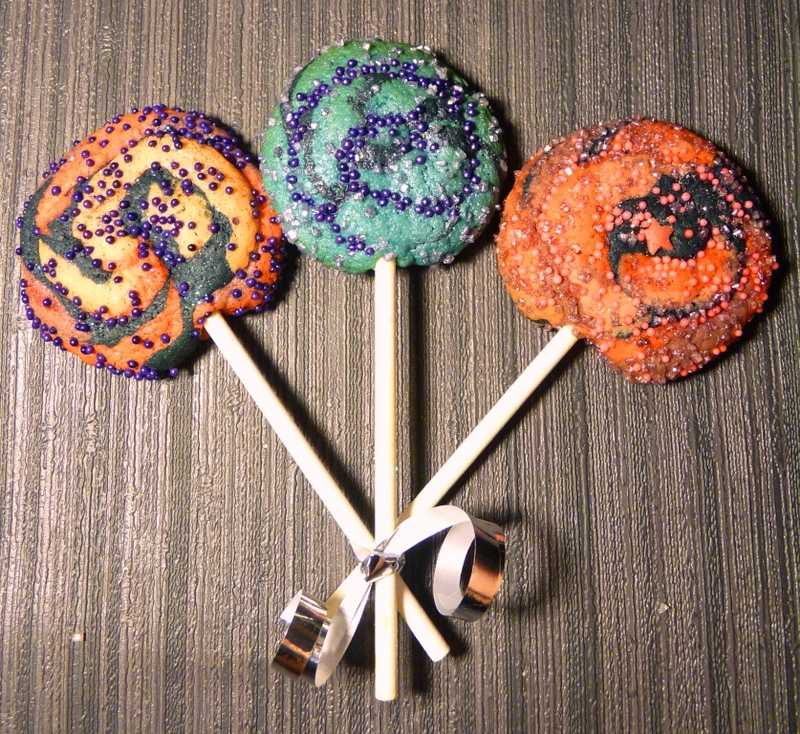 I’m happy to say we got the whole bonfire and fireworks thing out the way on Friday night, leaving me to enjoy a Monday evening curled up on the sofa, munching happily on these pretty cookie pops I made over the weekend. 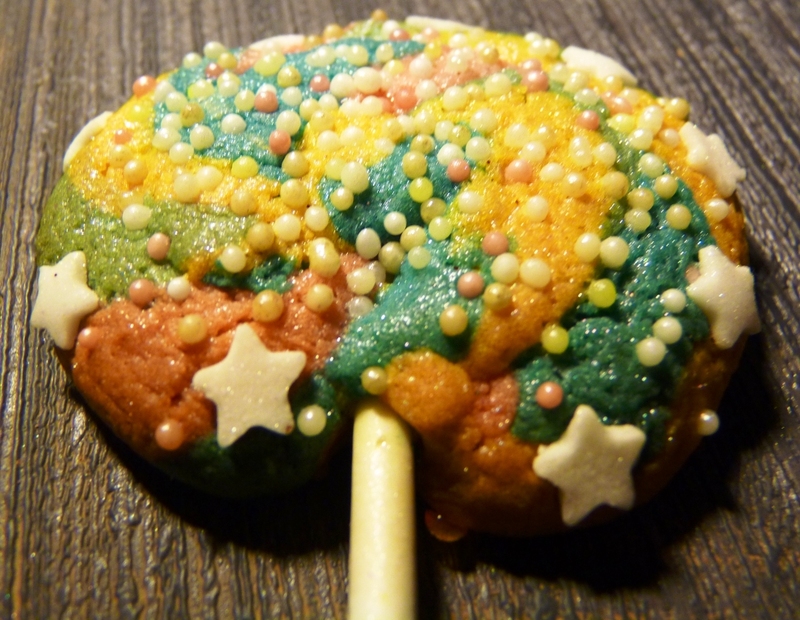 Originally I was going to make some iced cookies, but stumbled across pinwheels on the brilliantly named Rock ur Party. 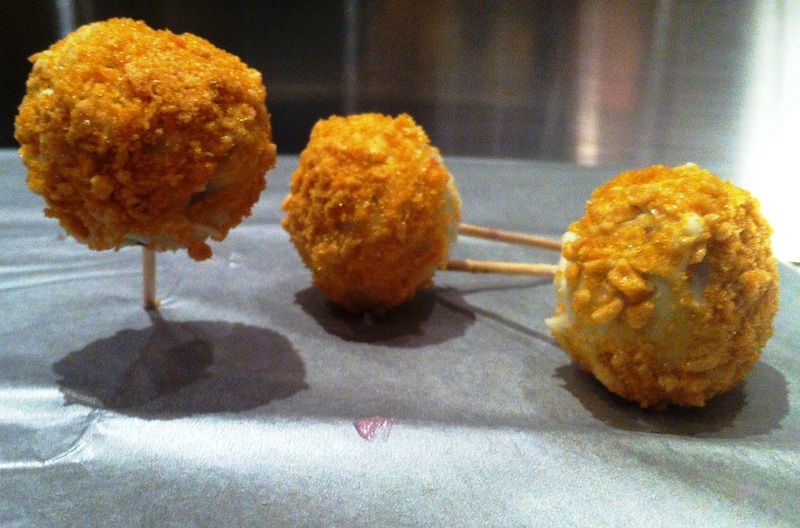 They are brilliantly simple to make, and I adapted slightly this recipe from bbc good food. 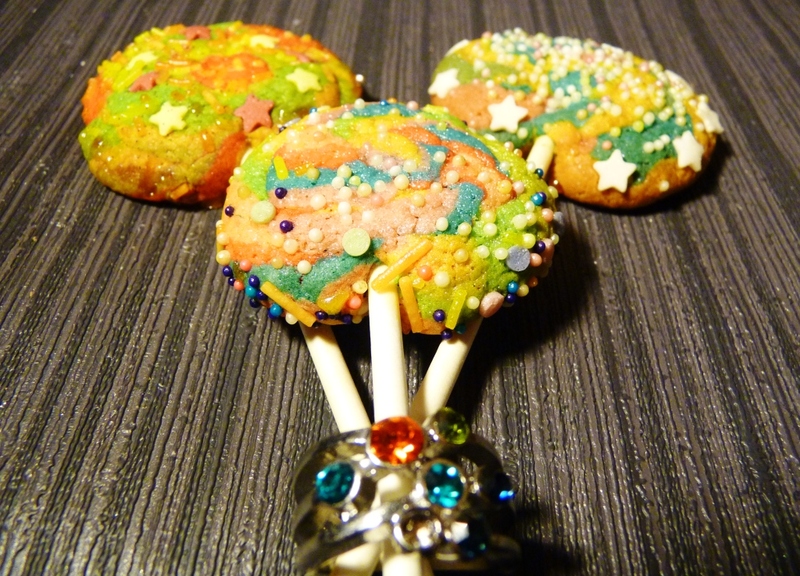 The last link I have to share from you is the delight that is Sweetapolita – who reassures me that baking biscuits on sticks is perfectly normal! 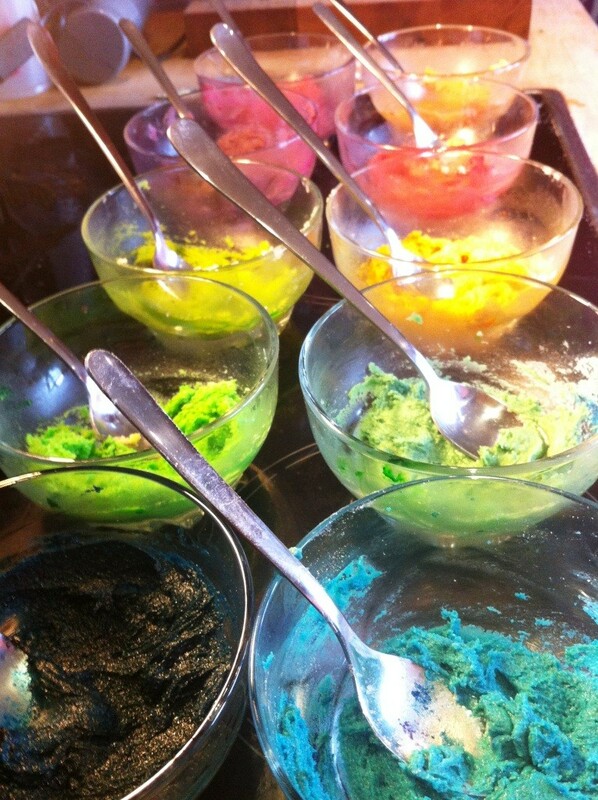 – colour, decorate, sprinkle… and bake at 180 for 8-10 minutes (don’t over bake or the biscuit will be too crunchy and the bright colours will start to brown). I chose to colour mine in all the shades of the rainbow, using and mixing all my gel colours to create 10 different colours. 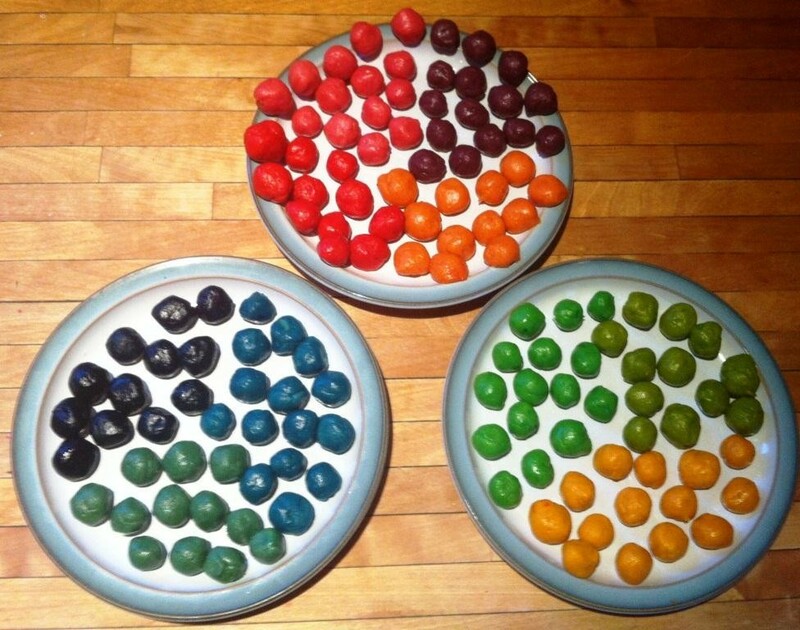 I rolled each colour into little balls (about the shape of a small grape), and popped them into the fridge for 1/2 hour as they were getting a little sticky. Next step was the most fun, combining the tiny balls into larger multicoloured ‘beach balls’ to make the coloured fireworks. 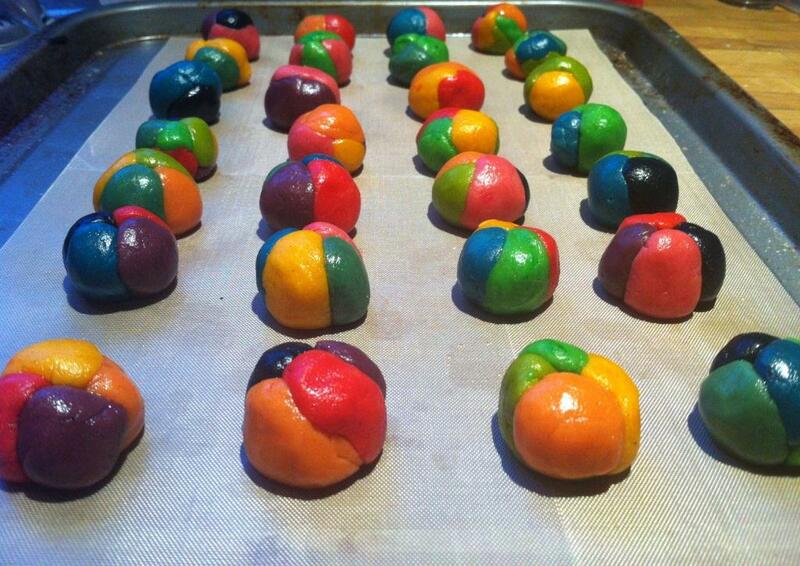 Than roll the edge in sprinkles, and too with more before baking, if desired. 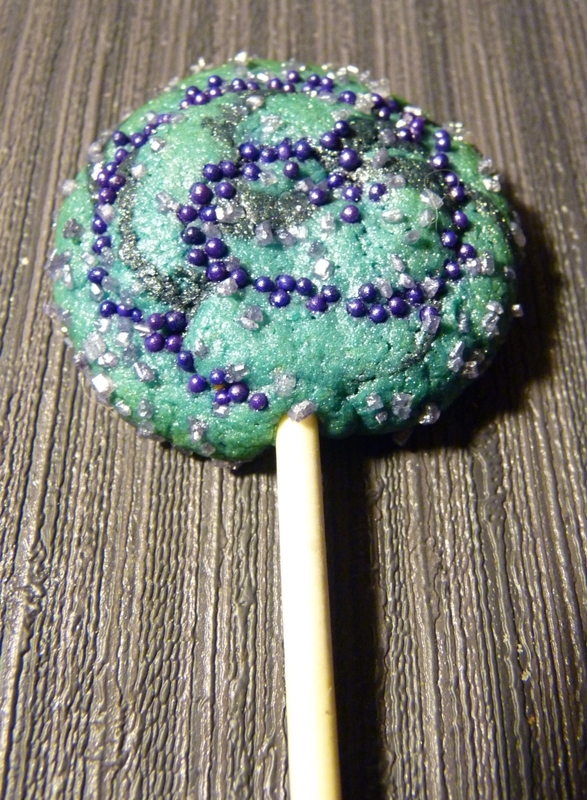 I used a mixture of sugar sprinkles, non pareils, sugar stars, and glitter sugars. 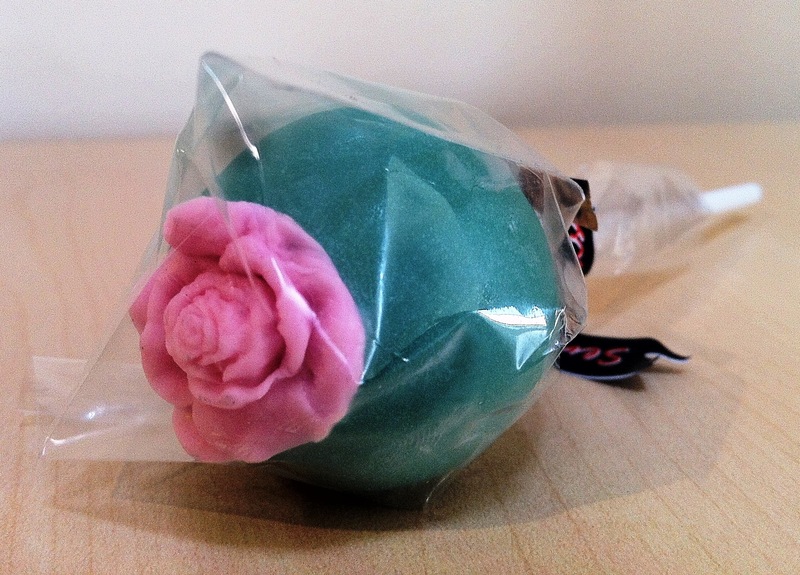 Once baked, I finished with a little shimmer spray and quick brush of edible lustre where needed. 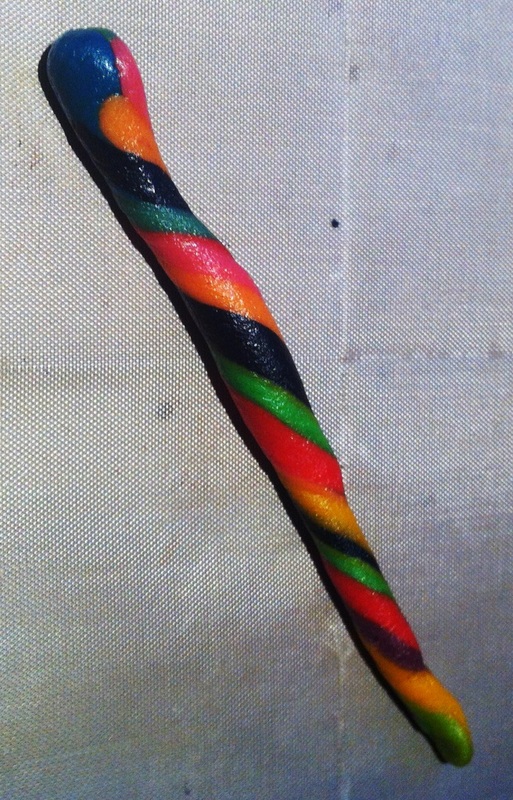 Ready to eat straight off the stick – yummy! 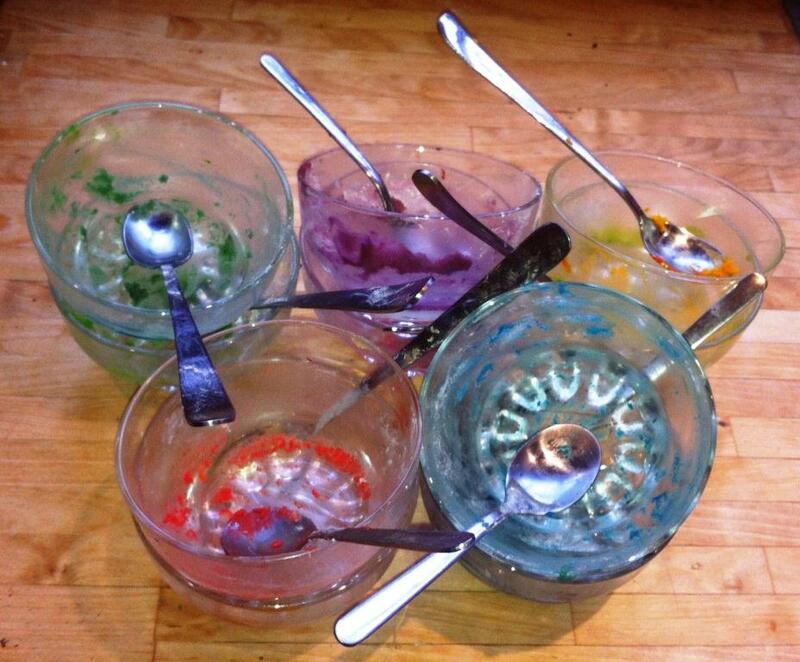 Did you guess what I made such a mess of last week? 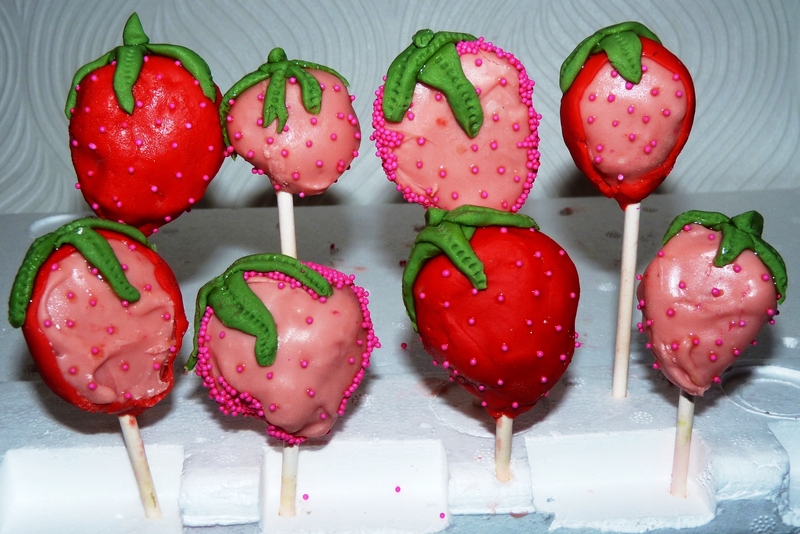 Sticky summer strawberries! I had some red sponge cake left in the freezer from my union jack battenburg, saved especially for making cake pops. 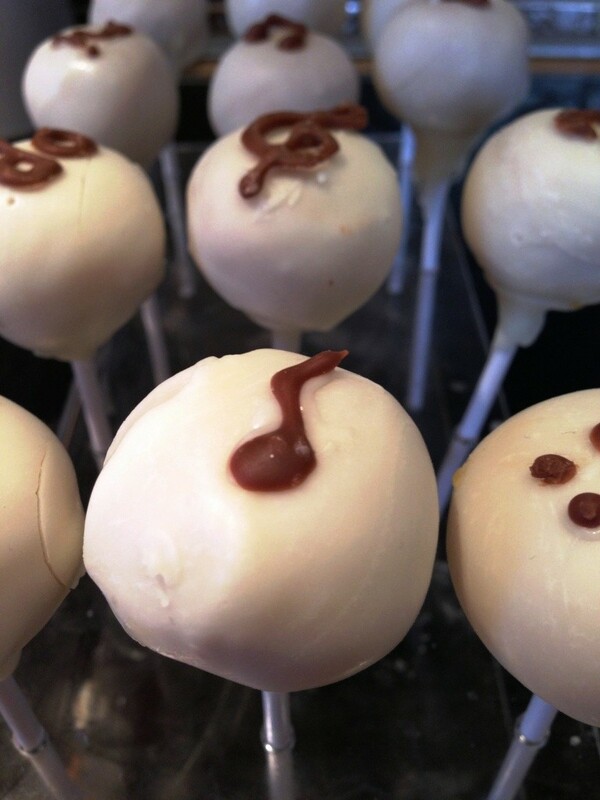 The recipe – if you could call it that – for cake pops is just cake and buttercream. Super simple. 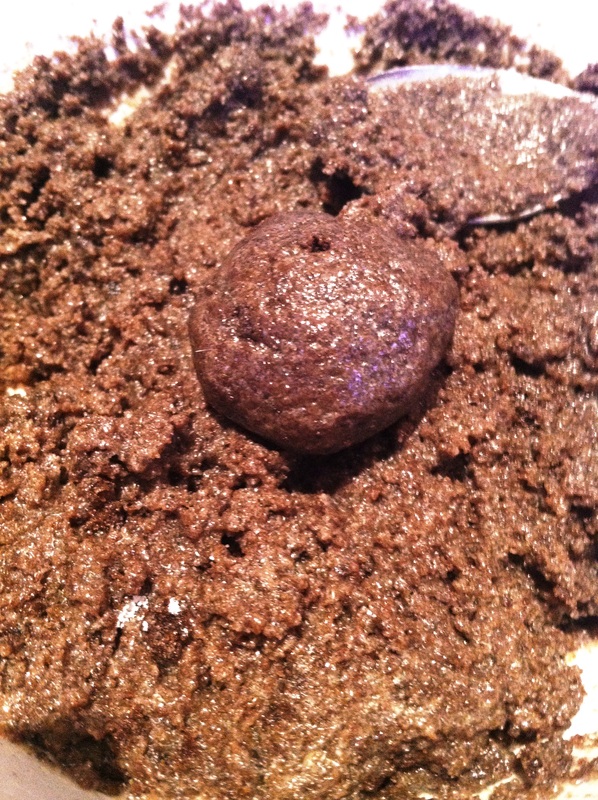 Mix up enough to get a firm texture that can be rolled into balls. Simple! 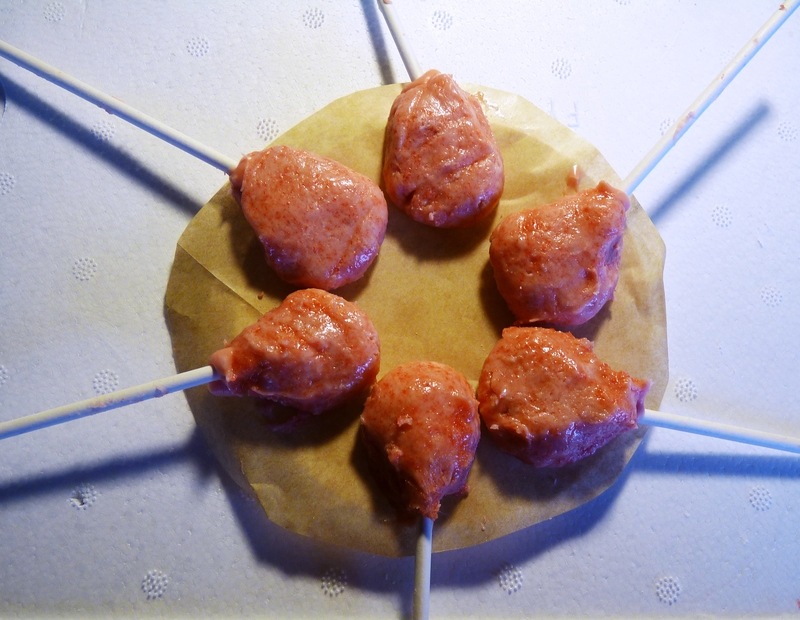 I decided to add some strawberry jam to give them a real strawberry mixture, passing it through a sieve first so there weren’t any pips etc., as cake pops need a nice smooth mixture. But – I wouldn’t recommend adding jam. The flavour is so subtle that you can’t taste it in the end, and it makes the texture extra sticky and harder to work with. 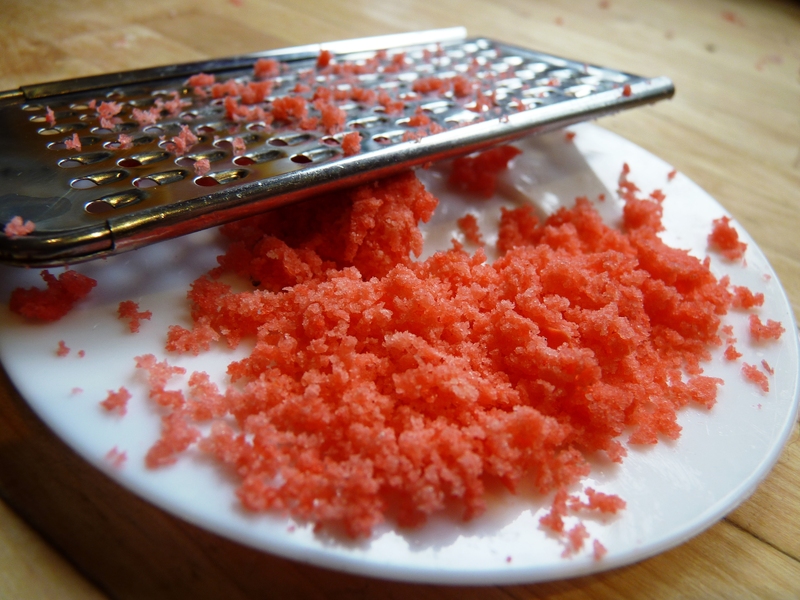 A great tip if you are using frozen cake for your pops – as soon as you’ve taken it out the freezer, use a grater to crumble it up finely. Works perfectly every time! You have to work quickly though, the more it thaws, the less well it grates. 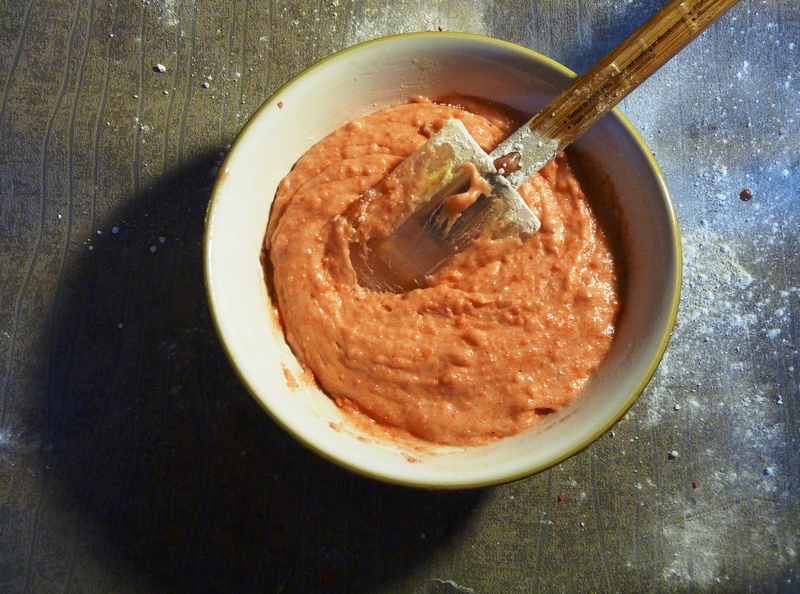 The buttercream, cake, and (not recommended) jam mixed up easily into a beautiful light pink colour. Into the fridge it went to chill for a little while, so it would firm up a bit to roll into balls. 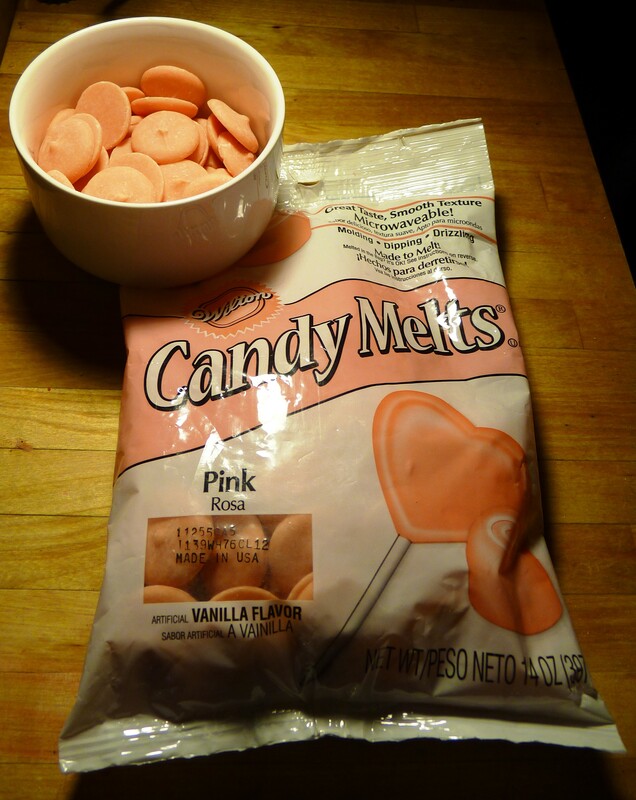 Next step – and I was super excited to finally be using these – candy melts! I’d bought these from hobbycraft quite a while back, and honestly not quite sure why it’s taken me so long to use them! Basically they are big coloured chocolate buttons – but are engineered (for want of a better word) to melt quickly in a microwave, stay liquid for quite some time, and then set quick and hard once you use them on the pops, without melting again if it gets warm. Hopefully that makes sense – basically they are perfect for bakers – although this probably means a lot of e numbers as well! If you over-heat them or need to reheat after they’ve set, they are easily liquified again by popping in the microwave with a little vegetable fat (I used trex). 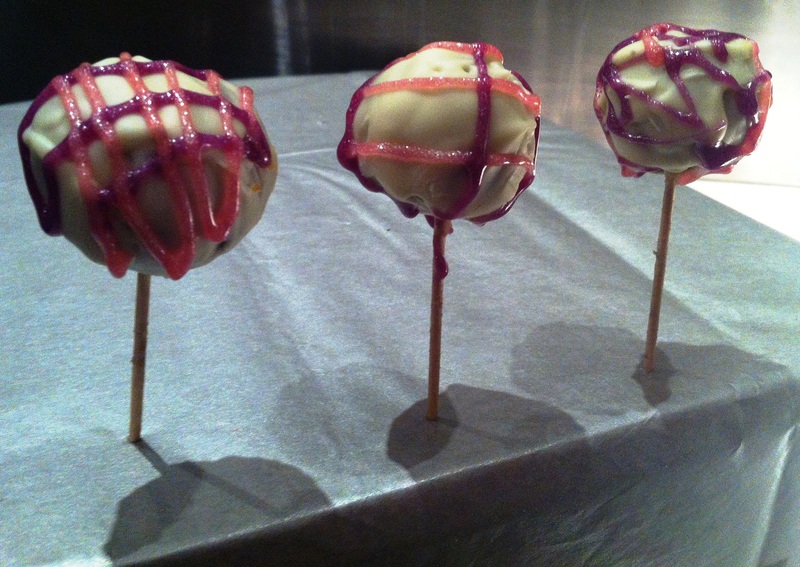 The cake mixture came out of the freezer, and I rolled it into balls, pinching a little at the edges for strawberry shapes, before dipping the sticks in the candy melts and securing them in the ends. Then, as the mixture was still a little sticky (and wouldn’t hold a warm candy melt mixture), they went into the freezer to firm up. 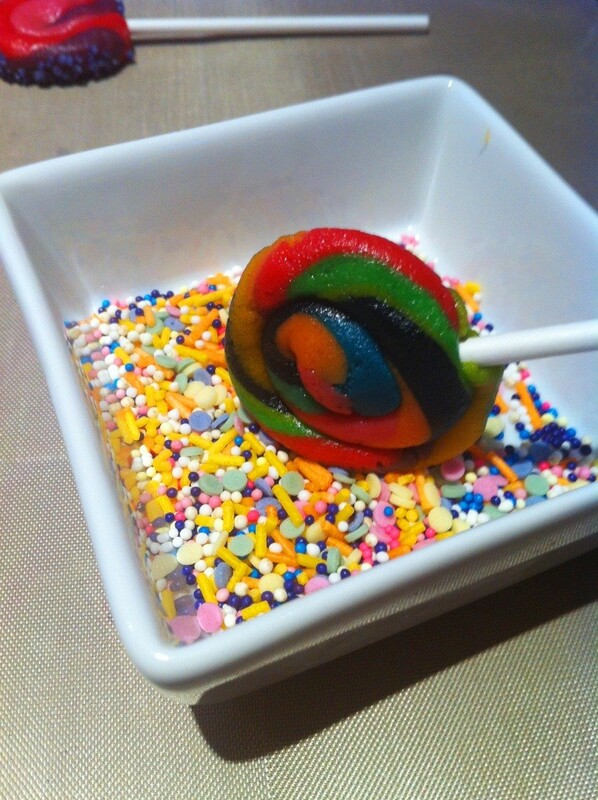 Next step was candy melt dipping / coating. This is still a work in progress for me – I don’t know how those videos online manage to dip in and out and end up with a perfect even covering! 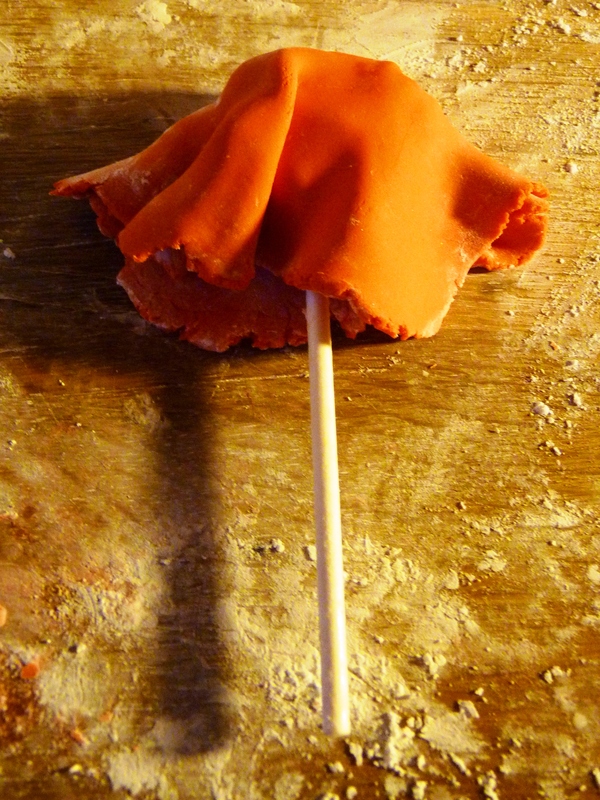 First – I wrapped some of the pops in red fondant, before pressing gently into shape, trimming the excess, and smoothing down the joins. 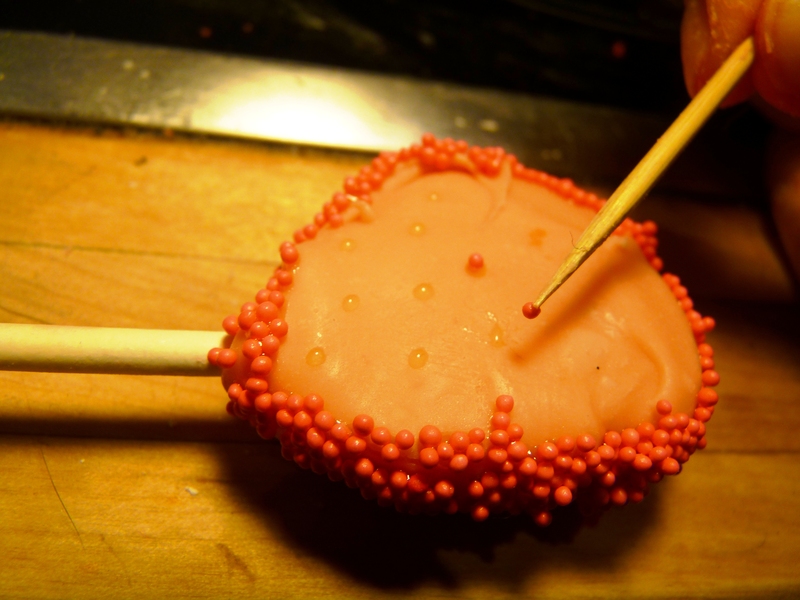 Some of the other pops I just edged in fondant – rolling it out before cutting strips and pressing them into place around the edge, and a third batch I put a very fine coating of golden syrup (corn syrup) around the edge, before dipping into bright pink sugar sprinkles. And the icing on the cake – green fondant leaves and stalks, shaped, carefully glued on with a little dab more syrup, and then imprinted with leaf lines simply using a serrated edge modelling tool. And – several hours later (I’m still learning) – I was done! Yes I have some way to come in terms of consistency of shape and size, but I was so impressed! After a little while in the fridge, to completely set, they came out tasting brilliant as well – a crisp crunchy shell, with smooth creamy (not strawberry flavoured at all, silly jam!) inside. Perfect treats for a warm summer evening. With a glass of Pimm’s, you say? Well, why not! 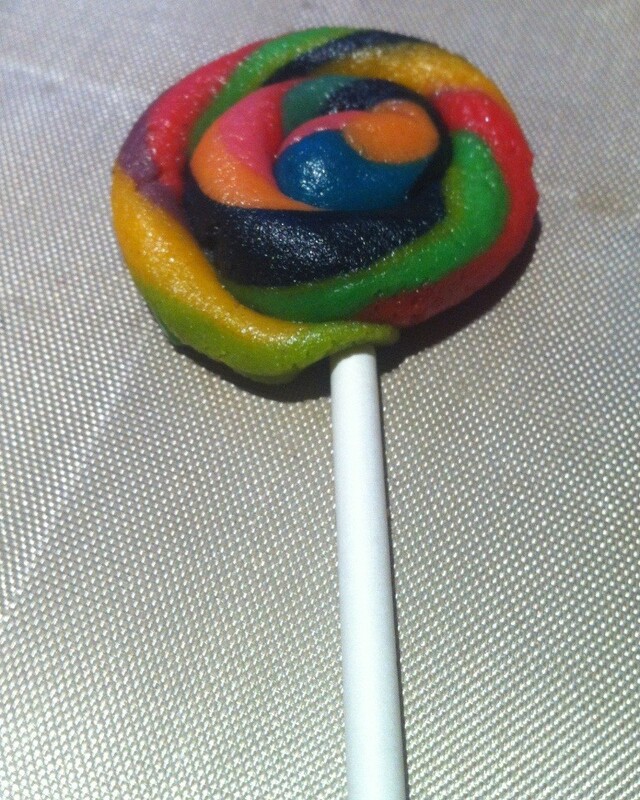 Up until last week, I’d only ever had one cake pop. I can remember it well. It was bought into our office by a supplier, attractively wrapped in cellophane, a milk chocolate pop, and just asking to be eaten. I sunk my teeth through the crisp chocolate only to be absolutely horrified. A cake I didn’t like! After the initial excitement of the crunchy chocolate layer, I was met with a dense, thick, almost marzipan-like centre. Most definitely no like-y. 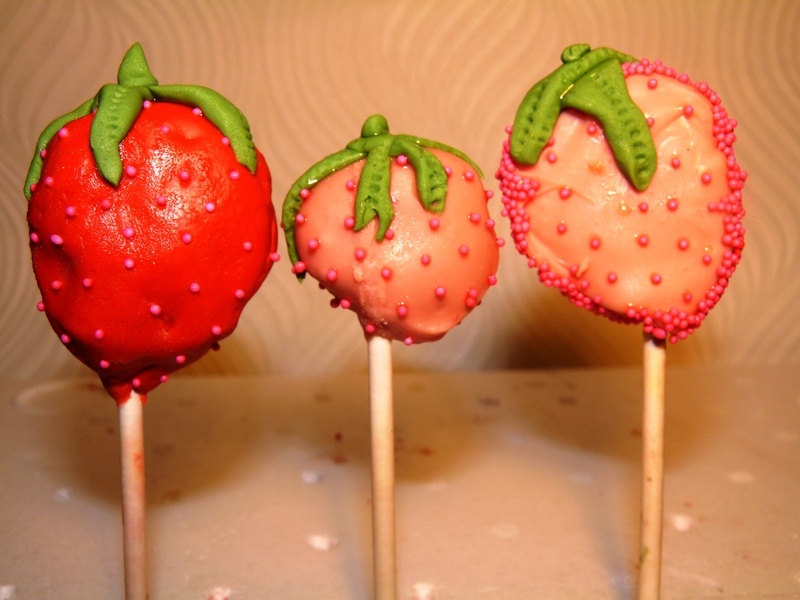 Don’t get me wrong, I have nothing against marzipan (Christmas cake just wouldn’t be right without it), but a normal day-to-day cake, or even cake pop, should be light, tasty and fresh. Disappointed, I warned my colleagues off trying any of the other pops, telling them to stick to our abundance of Easter chocolate instead. 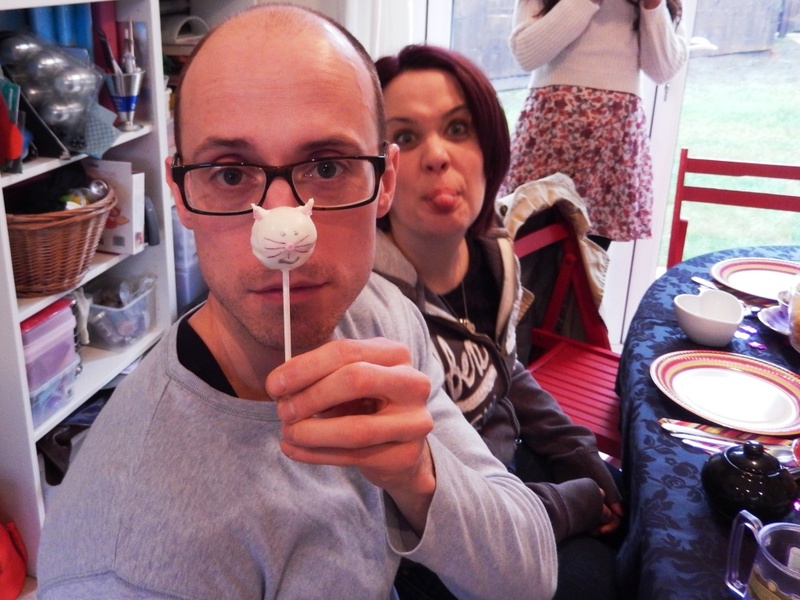 My comeuppance on cake pops came last week, when I was making Rob’s birthday cake. Trimming the cake to shape had left me with quite a lot of off-cuts, and not wanting them to go to waste, I tentatively decided to try my hand at making these little cakes on sticks – if they are so bang on trend that even topshop is selling them – how could I not?! Personally, I’ve always been fine with cupcakes the way they are… cake on the bottom, icing on the top. Simple but VERY effective! 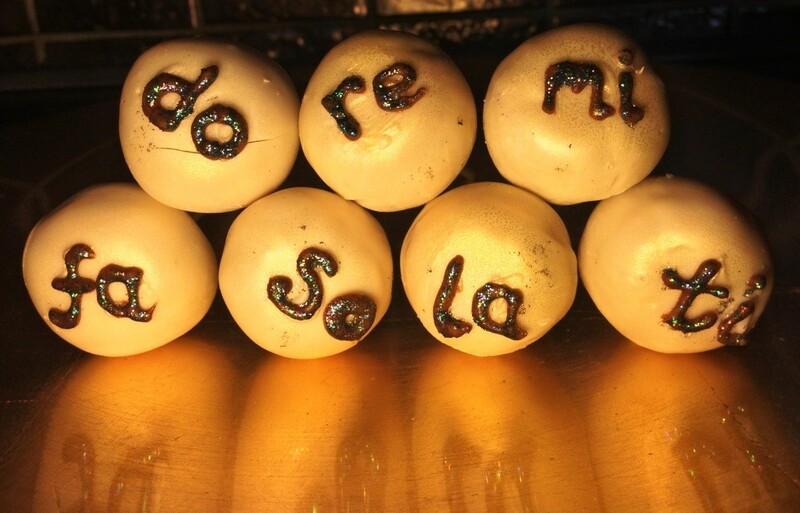 Once mixed, refrigerate, roll into balls, cover in chocolate, and tada! 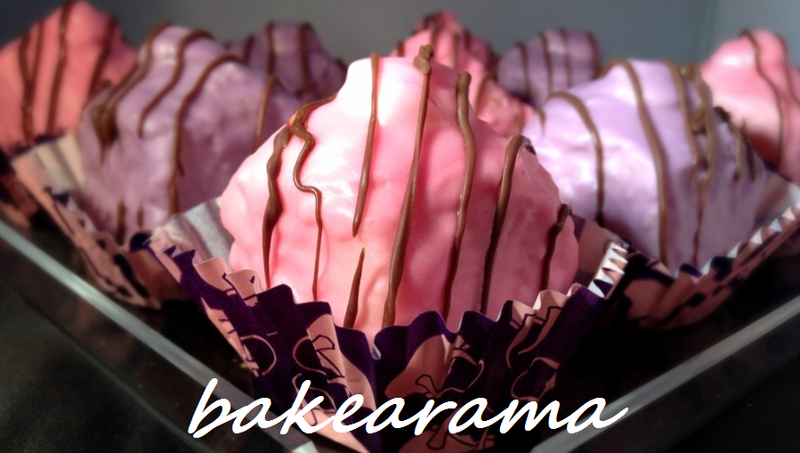 The one upside is that they’re incredibly simple – no icing nozzles, delicately covering in fondant etc. 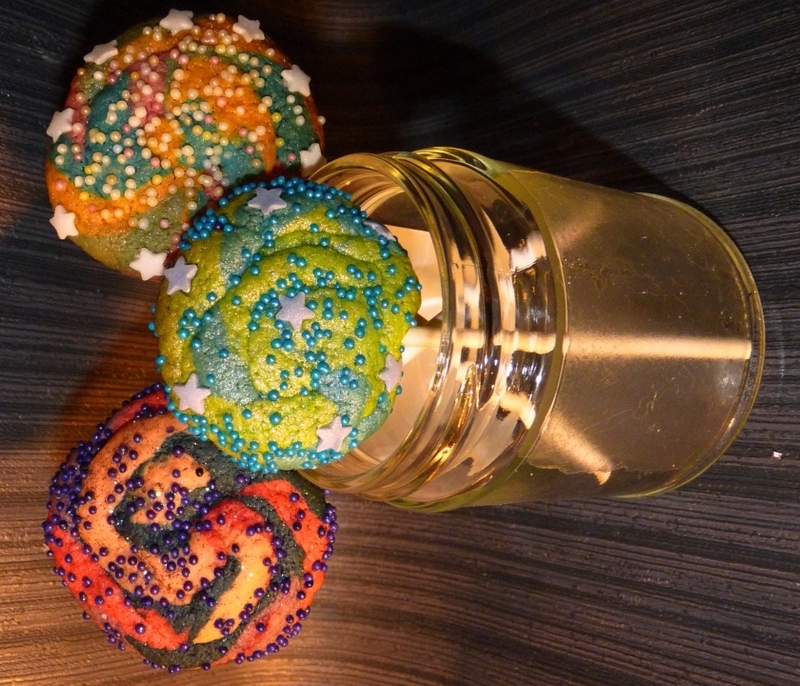 I kept the decoration simple on these – a quick dip in some simple sugar sprinkles. Don’t they look funny close up! Taste-wise, they weren’t bad either. Still not a cupcake though. At this point, if I’m honest, I’d rather still have the cupcake, and a piece of chocolate on the side. BUT… the real revelation came a couple of days after. I’d left the pops in the fridge so they didn’t melt, and happened upon them while look for something to make for dinner. 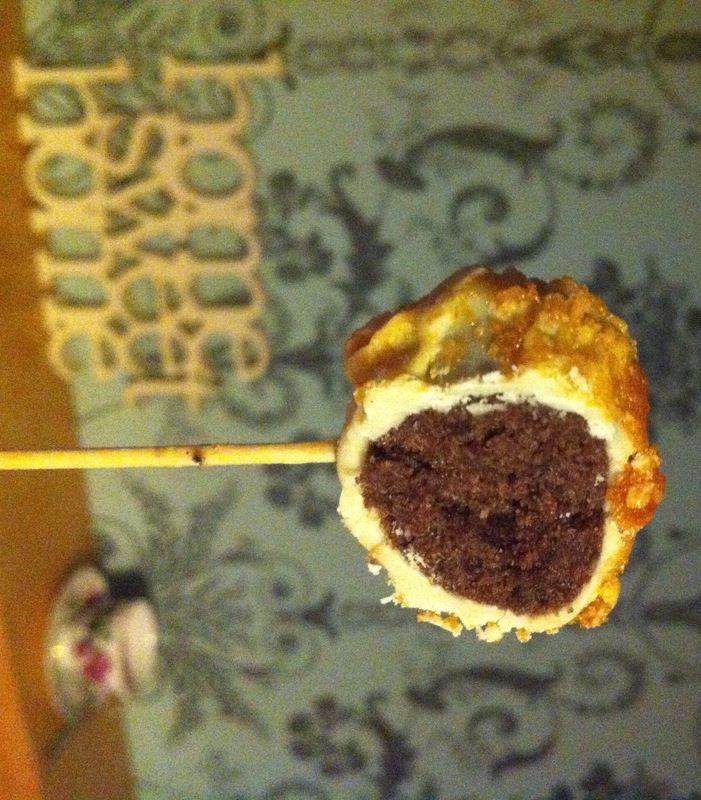 A sneaky bite into a very well chilled cake pop… yum! Sweet, crunchy chocolate, and a cool, creamy centre, with a great taste of delicate cake, all mingled into one yummy mouthful. I was a convert!